It’s Christmas time. Family, food, gifts parties are all elements of the holiday season that millions of people enjoy. The anticipation of waking up on Christmas morning and seeing what “Santa” brought you is something you look forward to. We wake up out of our warm beds and run to the tree to see what gifts await and then start opening them. Paper flies, cameras flash and shrieks of excitement fill the room. It’s a pretty picture right? You are probably wondering where I am going with this. 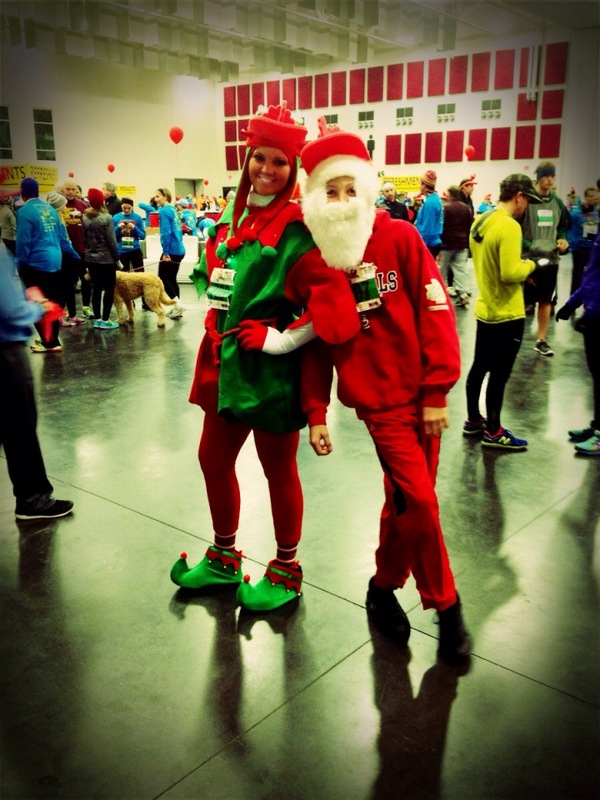 Why am I writing about a pretty normal Christmas morning? Well the reason is because I never had a “normal” Christmas morning. Wait, what? You read this right. I never had a normal Christmas morning. I had what I consider a different kind of normal morning. Now you are probably really wondering what I am insinuating by making a statement of this nature. The truth is, on Christmas morning, my family and I worked before we opened presents. Yes, we worked and I never, ever complained. You see, I was raised by a farming family. (Yes, I was one of the lucky ones who can say this!) 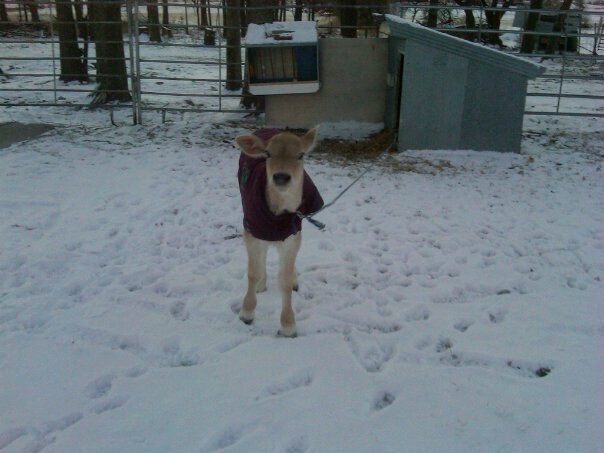 We had a dairy farm and just because it was Christmas morning, never meant we could put the farm on the back burner. We often hear farmers say, “On Christmas morning, we did not open gifts until the animals were cared for.” To fully grasp the concept of what this statement means, I wanted to emphasize it to show just how important this is. This may sound cruel to some or it may not even make sense. How dare these parents make their kids wait to open their gifts on one of the most exciting mornings of the year?!?! Whether you are/were a farming kid, farming teen or a farming adult, Christmas morning began as just another day on the farm. Responsibility: Just because it was a holiday, did not mean that we could shut the farm down like it was a typical business. Holidays are just another day on the farm. We could just not tell our livestock that they had to fend for themselves because it was our vacation or an important date on the calendar. Christmas was no different. 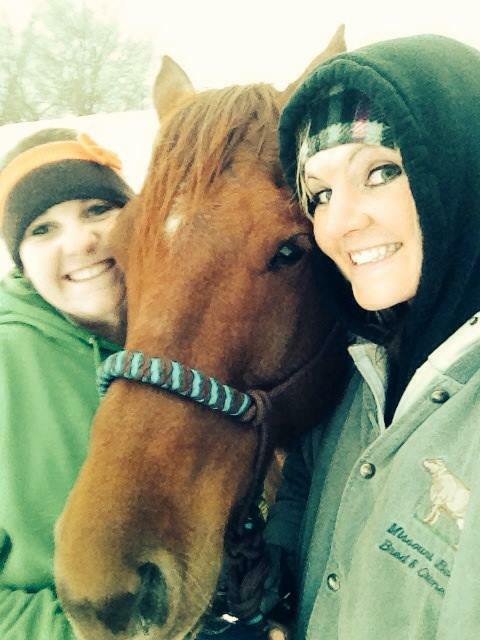 Even though there were gifts under the tree and family dinners to go to, we had to take care of our animals. We had to be responsible. We had to be the caregivers we were designed to be. Patience- One of the most difficult things in life to learn is patience. As a kid waiting to open presents on Christmas morning was a difficult task; however the overall lesson learned is irreplaceable. 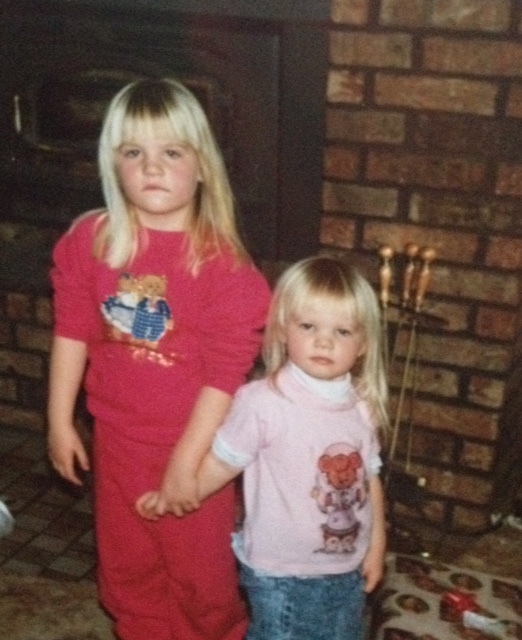 My sisters and I learned that we just had to wait patiently and not complain. My parents had to exercise patience in knowing they had three anxious girls in the house waiting to open their gifts, but having to get their chores done outside first. Overall, patience was learned which is a truly valuable life skill. Sometimes, learning patience was hard…But looking back, is was worth the lesson! Priorities- As farmers know, your farm is one of your top priorities. It was your livelihood and your passion; therefore it came first. My family’s farm was no different. 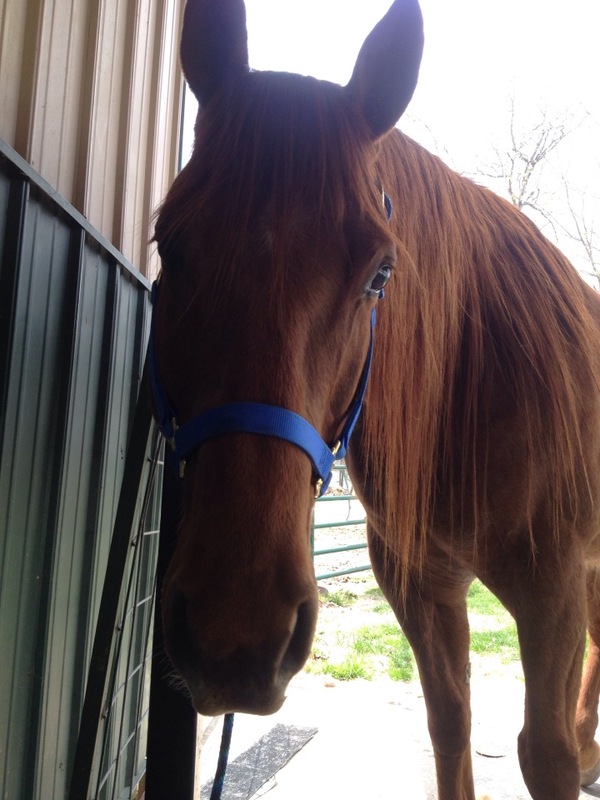 It was a priority to care for our animals in the best manner possible. 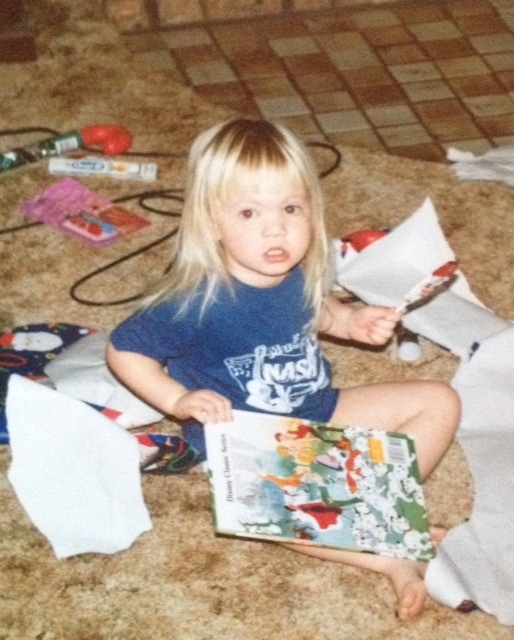 Like I have mentioned before in this post, Christmas morning was no different. We fed and cared for the animals before our gifts were opened. If that is not dedication, I do not know what is! Family- It was a general rule that gifts were not opened until our entire family was back in the house. Granted this is the case for a lot of families, but we stuck true to this rule no matter what. 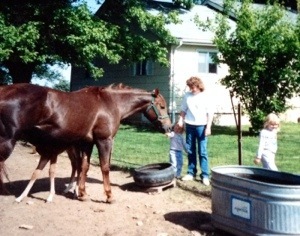 If one of my parents had to stay outside longer to tend to a sick animal or fix fence, we waited. It was a full family effort to run the farm; therefore it was going to be a full family affair when we opened our gifts. Family is so important and embracing the entire family moment on Christmas morning truly nailed this point home. Dedication- You know, farming takes a lot of dedication and passion. You truly have to love what you do in order to deal with events such as a delay in opening gifts on Christmas morning. I think it says so much about farmers who can stand and say they tend to their farm first before gifts are opened. What this taught me growing up, that in order to be successful you have to be dedicated to your purpose. 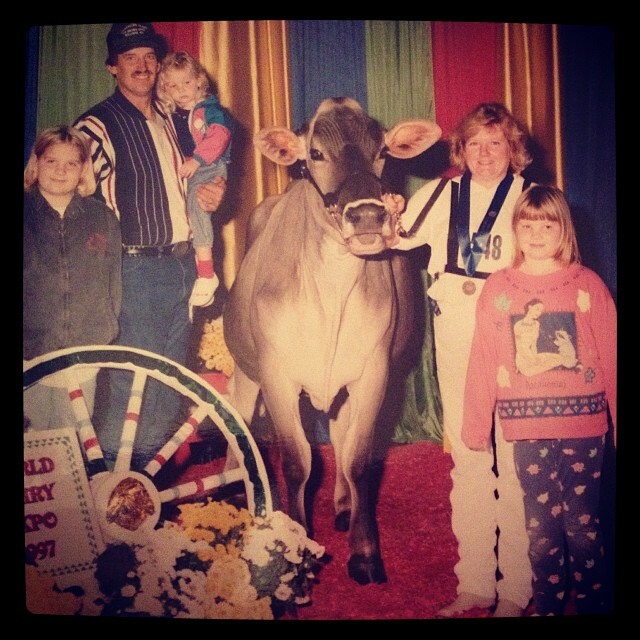 In my family’s case, our purpose was ensuring our animals were well taken care of in order to have a successful and prosperous farming operation. As you can see, Christmas morning in a farming family is not like a lot of families’ Christmases. However, I consider it a different kind of normal. More like a farming kind of normal. I knew no different growing up and looking back, I cannot complain one bit. I am honored to say that my Christmas mornings consisted of farming and caring for my animals first and opening my presents second. 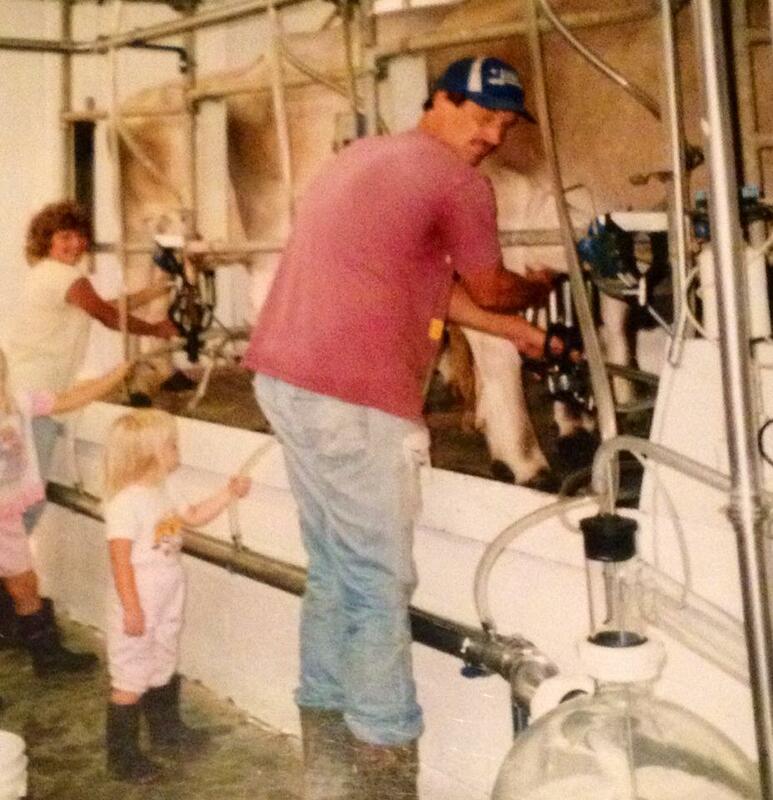 I am honored to have had parents to show me how the farm takes priority and how important being dedicated is. 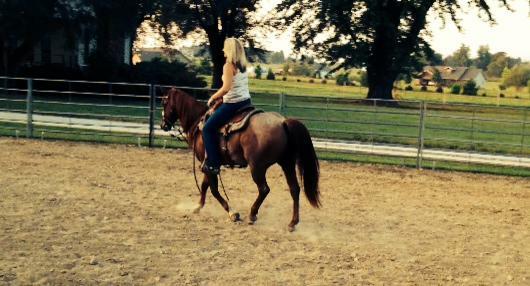 Learning these lessons is just further proof of how much of a blessing being raised on a farm was for me. 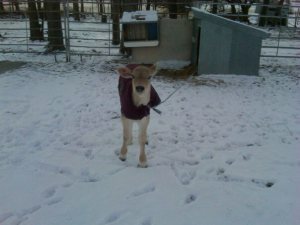 With Christmas being just hours away, I just wanted to write this post as a way to show the world just how much farmers care for their livestock and just how unique the farming lifestyle is. In addition, I wanted to provide all you farmers out there a chance to take a trip down memory lane to your own farm Christmases. Plus, I wanted to remind all of you just how great you are for caring for your animals each and every day, no matter what holiday it is. What are some of your fondest Christmas morning memories? What were your experiences? 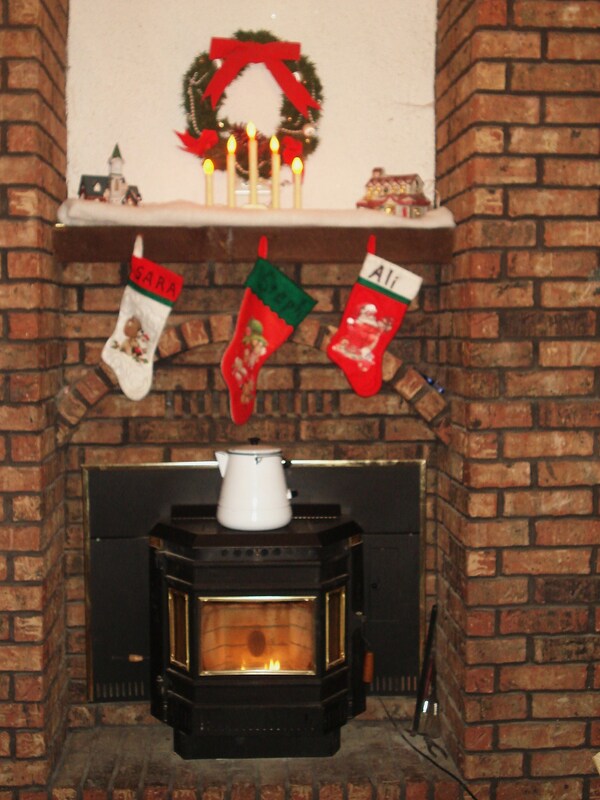 How were your Christmas mornings on the farm? I want to wish each and every one of you a very Merry Christmas. Farmers, thank you for your dedication. For you farm kids, as tough as it may be to wait to open your gifts, remember you are some of the few who can proudly say you waited to open your gifts because your parents farmed. Trust me, you will be so thankful for this. I know I am. 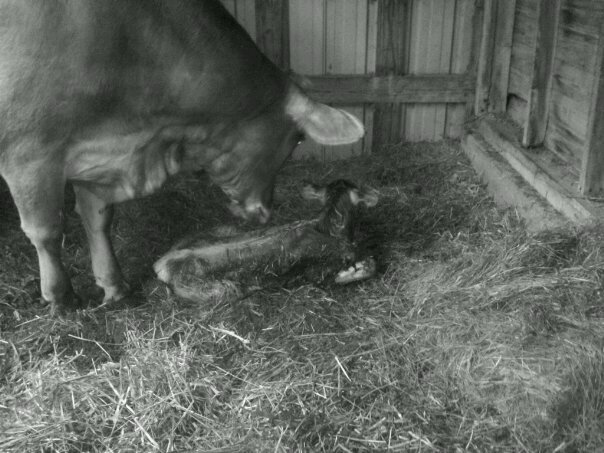 Having the opportunity to have been born and raised on a farm is truly a blessing. 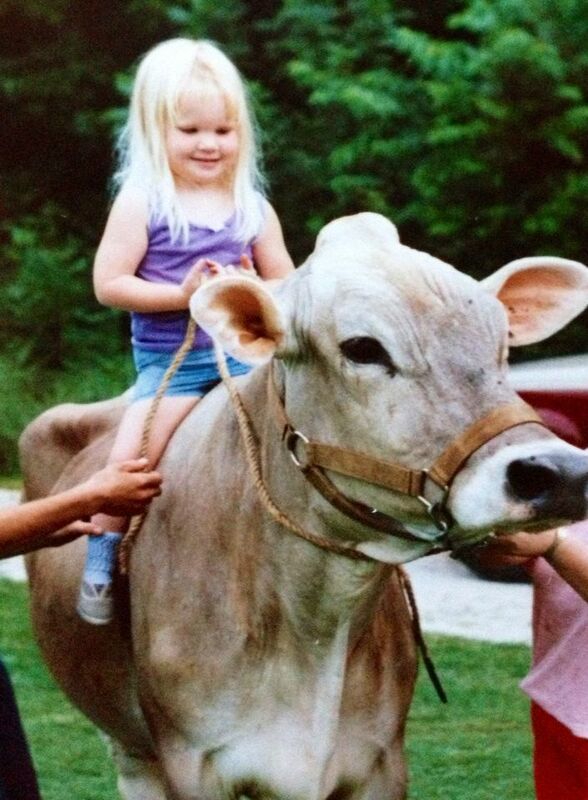 Growing up on a farm has taught me so many values and life lessons which have molded me into the person I am today. 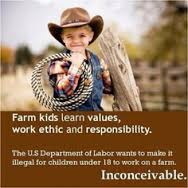 The truth is, those who have had the opportunity to have been raised on a farm or currently reside on one, understand this concept fully. There is absolutely no doubt, we are lucky. Why? 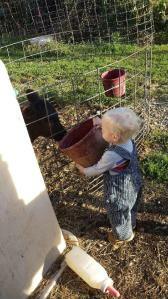 What makes growing up and/or living on a farm so great? Well, the answer is not as complex as one may think. In fact, the answer is quite simple. The honest truth is there is no other lifestyle like it. There is no other lifestyle where one can learn and be responsible for so much, while fulfilling the role of feeding the world. Pretty remarkable, huh? 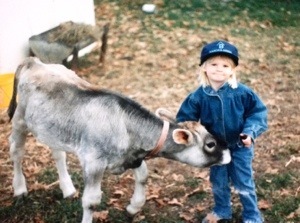 Previously, I have created a post about the truths of growing up a farm kid and how the entire experience is so unique. Now, I want to take it to the next level. Now I am striving to show the world just how amazing living the farming experience is. 1) Nothing compares to the value of hard work and a strong work ethic. This is something that will never leave you. 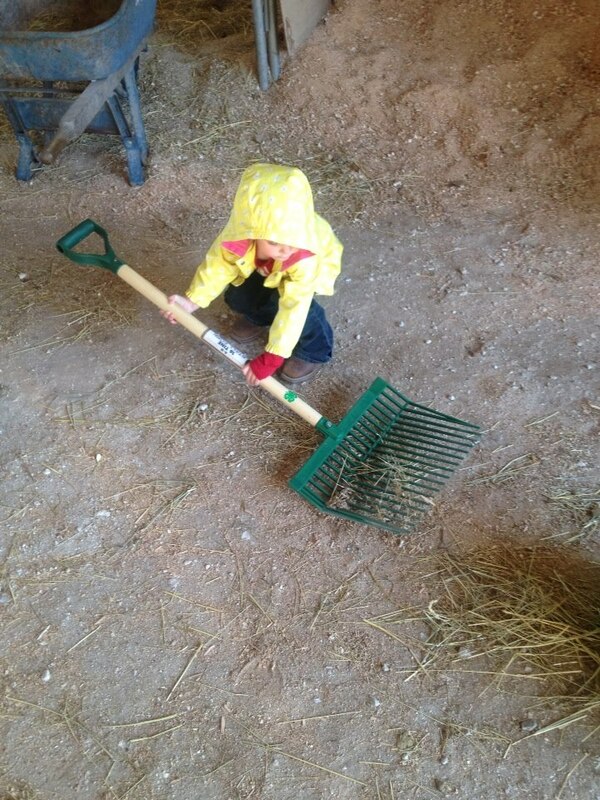 Hard work is required on a farm. If you are not willing to work, your farm will not survive; therefore you learn at a very young age just how important hard work is and how far it will take you. 2) Nothing comes easy. For all who have stepped foot on a farm can attest to the fact that farming is a tough lifestyle. There is really nothing easy about it. It is a 24/7 job, which a concept not a lot of people can wrap their heads around. You then learn that in order to accomplish something great, you must be willing to take a path that is far from easy. You cannot ever take the easy way out. 3) You will do whatever it takes to keep your family’s tradition alive. Think about it. 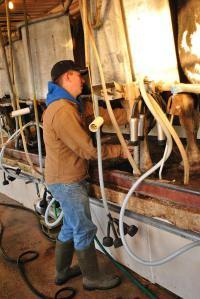 98 percent of farms today are family owned. Many farms have been passed down from generation to generation. 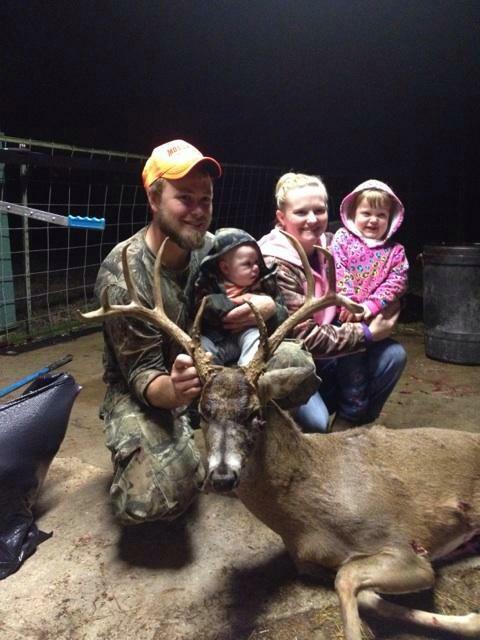 You learn the importance of your family’s tradition and then will find the desire to uphold that tradition. Your family is one of the most important things in your life, so you will do whatever it takes to protect the heritage. 4) Responsibility. Farming teaches you this imporant quality. As a farmer, you are responsible for so many entities; therefore, you must develop responsibility to ensure the needs of your farm are met. You then learn that responsibility is important in everything you do. 5) Priorities. Your farm comes first. If you have a sick animal, you stay with them so that you will save their life. You have hay down and a storm comes. 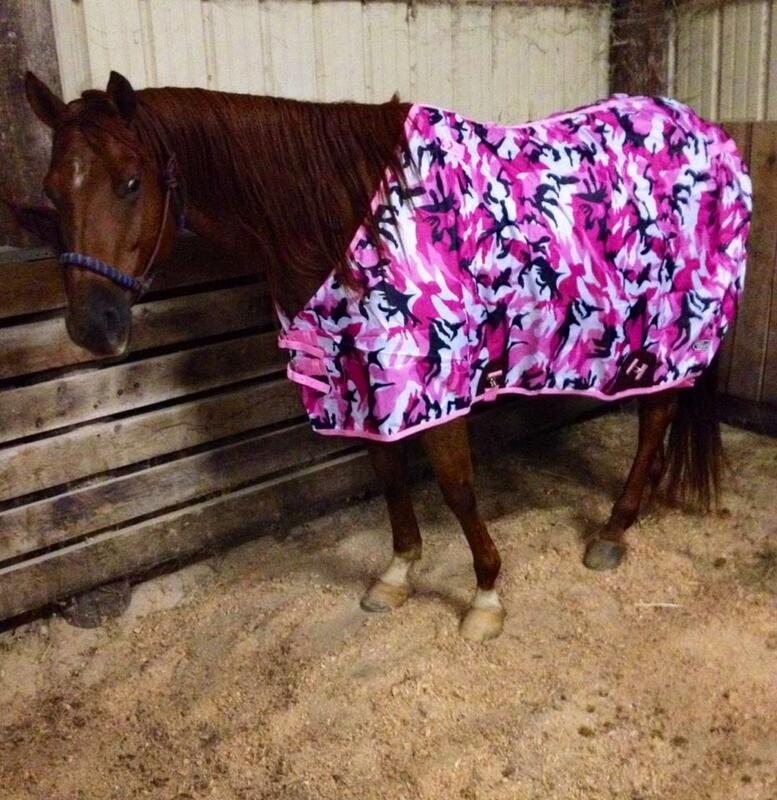 You drop everything to get that hay in. Sometimes, this means you must miss out on normal life events – parties, family get-togethers, etc. 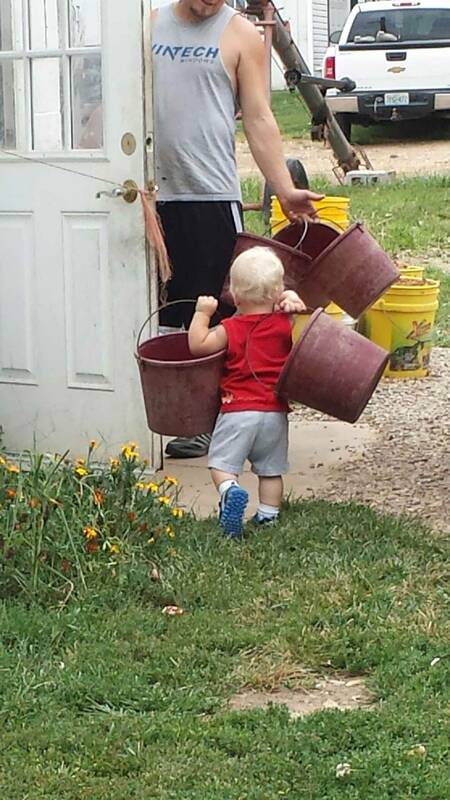 You do whatever it takes in order to keep your farm successful. You learn to prioritize. 6) Importance of faith in farming. Farming is hard, there is no question about it. In order to continue, you have to have faith. You learn that faith is the basis of every endeavor you face. 7) Fully appreciating God’s works. 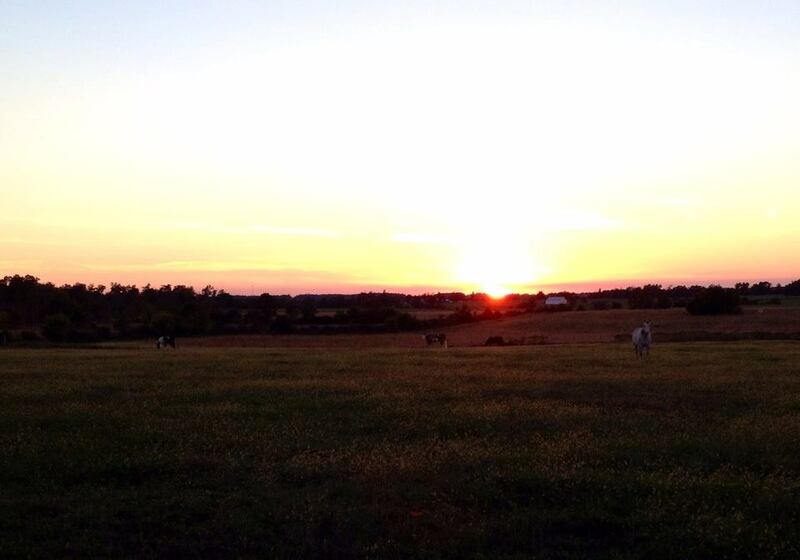 Living on a farm provides you the opportunities to witness several of God’s works. Sunrises, sunsets, births of newborn animals, watching a mother caring for her young, watching your kids grow and prosper on the land you have worked so hard on, watching your crops grow… God works every day and you are lucky enough to witness it. 8) Essence of listening. Farming requires listening. You listen to your heart to know what steps to take. You listen to your gut when making decisions. 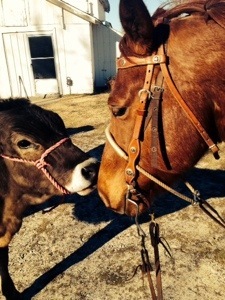 You listen to your animals to know what it is they need. The truth is, you become a person who can listen which is very hard to come by. 9) Working for future generations. You are the one not only responsible for feeding the world for years to come. You are also the one responsible for doing what it takes to get your children to follow in your footsteps. You are working for them. 10) Concept of achieving a goal. 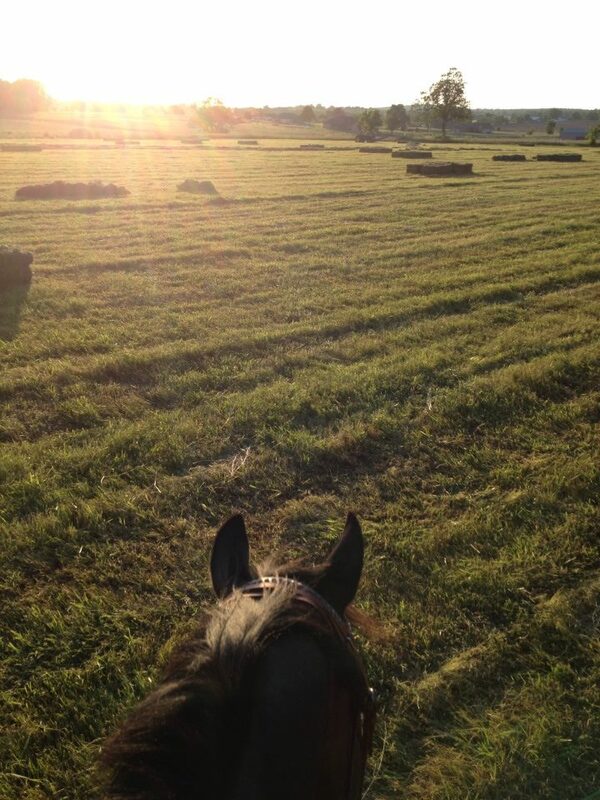 You set goals – when you want your hay cut, when you want to get your planting done, how many calves you want to send to the sale barn, and the list goes on. In order to meet your goals, you must have a plan in place and the willpower to follow that plan. You have determination to achieve the goal and the rest is history. 11) Problem solving and critical thinking. Each day, you are faced with a challenge. You have to learn how incorporate critical thinking in order to solve problems in the most efficient way possible. 12) Care and compassion. You have to have this in order to be a successful farmer. Farming takes someone who is caring and compassionate. There is just no other way of putting it. 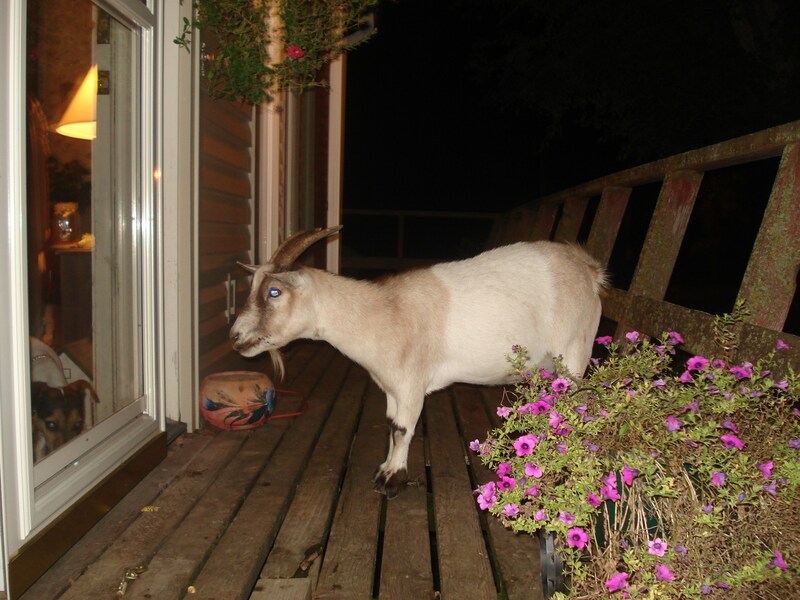 13) Being a caretaker – family, land and livestock. You are the one responsible for caring for your family, your land and your livestock. You play a huge role in so many different ways, which makes the farming lifestyle that much more exceptional. 15) Never giving up. Persistence is key in the life of a farmer. No matter how high feed prices get, how much fuel costs or how low the market prices get, you have to push through. This persistence shows through in every task you face. 16) Being humble in good times and strong during the bad. As with anything else, there are going to be good times and bad. With farming, it is so important to stay humble when things are good because in a blink of an eye, things can turn south. More importantly, you learn that you must stay strong during the bad times. The way you handle bad times encompasses how you will get through. It will make you stronger to endure more challenges for years to come. 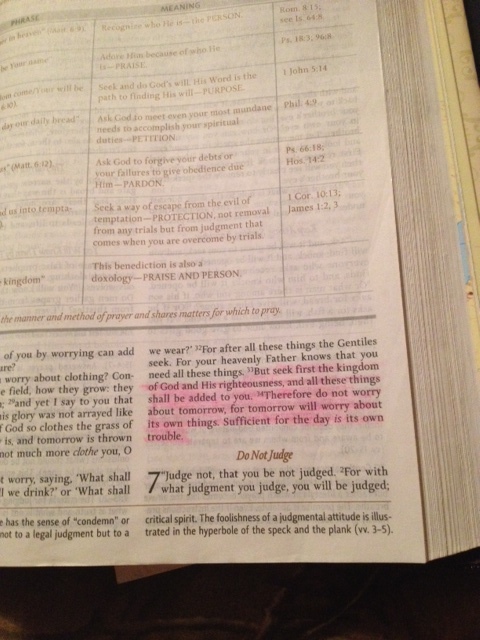 17) Knowledge and wisdom. The amount you learn – from basic remedies to solve everyday problems on the farm, to medicines for your animals, etc., each day provides more learning experiences that makes you that much better. 18) Respect – elders, land, animals, etc. You respect those who have farmed before you. 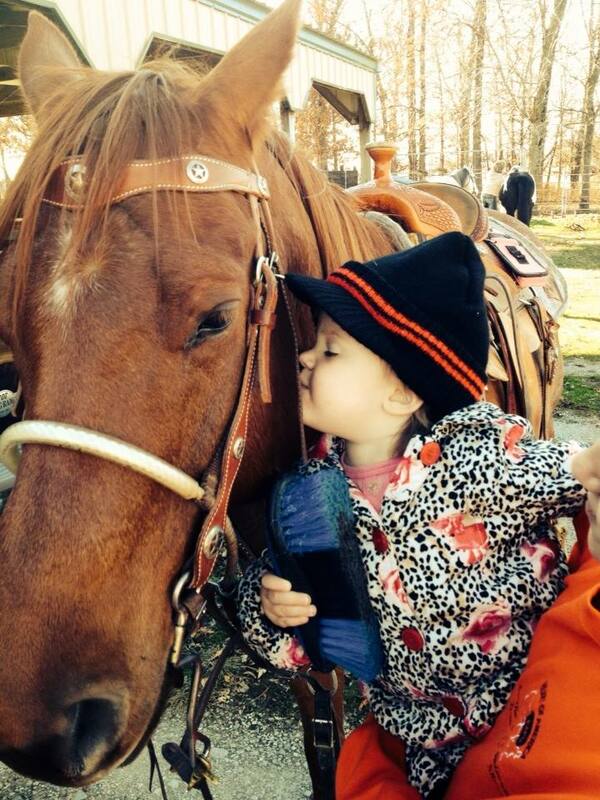 You respect the livestock and land that allows you to provide for your family. This is something that will never leave you. 19) Importance of agriculture. You quickly learn your importance. YOU are the one responsible for putting food on tables all over the world. Without agriculture, we would not survive and you completely understand this. 20) Knowing the character being a farmer instills into you is something you will never be able to replace. With fewer and fewer people being directly involved in production agriculture, you understand your worth. You understand you are a rarity. The pride you have for your lifestyle inspires you to work hard to be the best person you can possibly be. 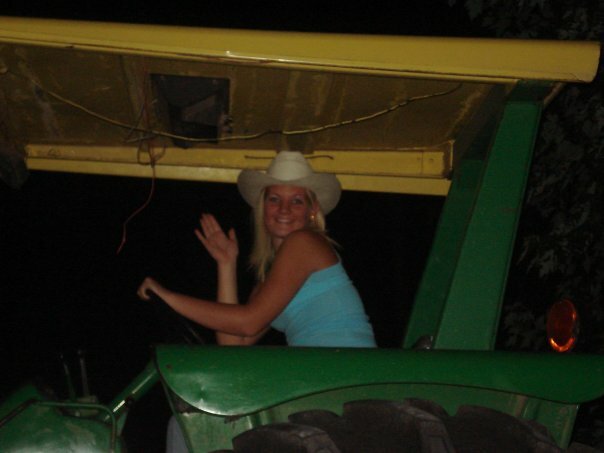 As you can see, growing up on a farm reaps benefits that follows you throughout your life. It is something you learn to be proud of and you are sure to thank God every day for the opportunity you had or have to be a farmer. Unfortunately, not a lot of people get to experience this. 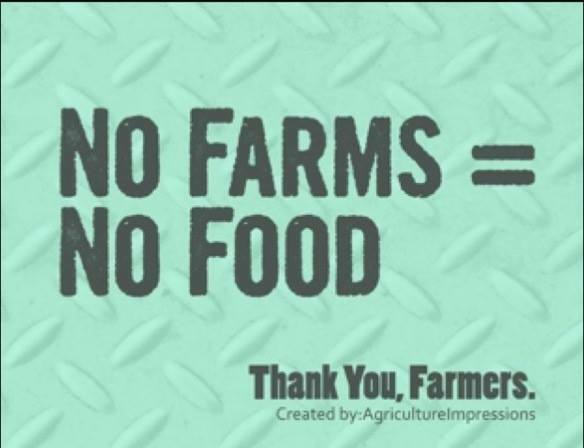 Not many people “get it.” However, for the few of us that are left, it is up to us to protect the farming lifestyle. It is up to us to protect our heritage and ensure families have food on their tables for years to come. We truly are special people. We truly are a gift. As farmers, we have a purpose. As farmers, we have values in which cannot be replaced. Are you proud to have grown up on a farm? Are you proud to still live on one? 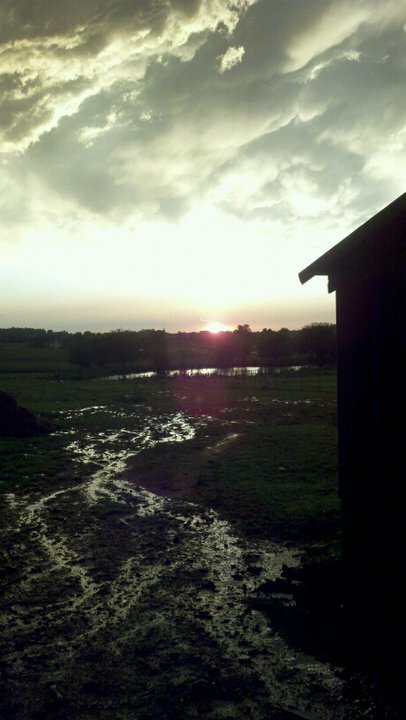 I hope this has served as a reminder just how incredible, yet tough, the farm life is. If you are proud to be a farmer, I encourage you to share this post. Show everyone you know just how amazing farming is. Remember just how special the farming life is and as always, be sure to thank a farmer. P.S. 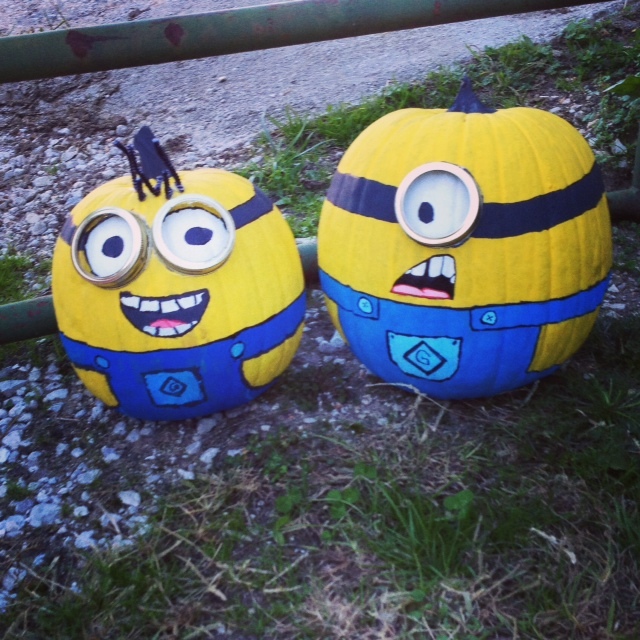 – Have a safe and Happy Halloween!!!! 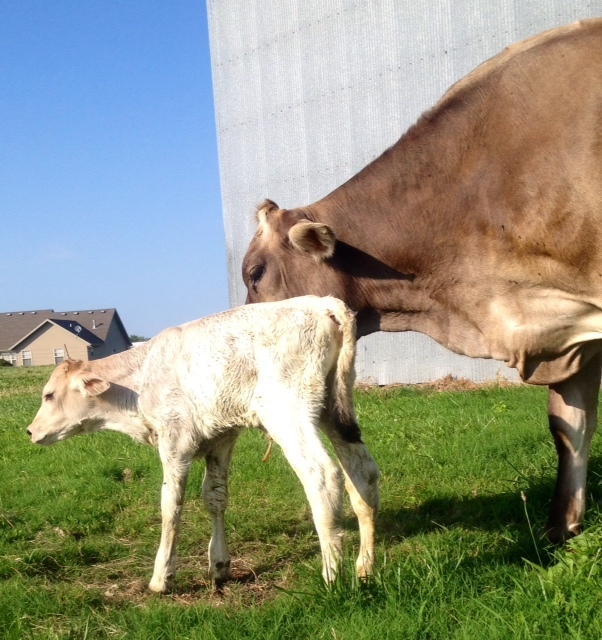 A blog post dedicated to farm moms everywhere in honor of Mother’s Day. In case you forgot, today marks a very special day that honors all of our wonderful mothers. Yes, it’s Mother’s Day. When I think of this today, I cannot help but think of my own mother. Even my grandmothers, my aunts and other women who have all been major influences in my life. What do all these women have in common? They are all farm moms. Let’s face it, our farm moms out there need some time in the spotlight. Well, here is their opportunity. As you read this post, I encourage you to think about the farm mom and/or moms in your life. Think about everything she has done for you while you were growing up and/or everything she continues to do for you. Farm moms are truly unique and one-of-a-kind because they truly wear so many hats. From raising the kids, to filling in for dad when needed, to some days spending time doing farm chores and other duties one the farm, our farm moms truly are rock stars. So, here is a tribute to all of you farm moms out there. 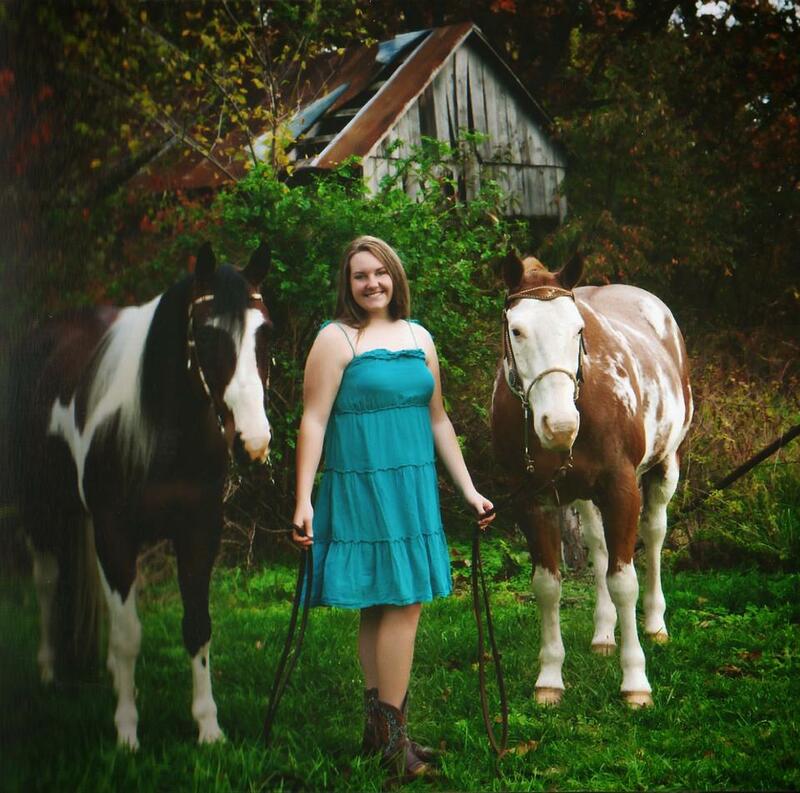 It’s a poem that attempts to display just how special farm moms are and how many responsibilities they have. I hope you enjoy this, and I really hope you will share to show the world just how awesome our farm moms are. She is one who works hard from dawn to dusk and dusk to dawn. And is even dad’s number one helper hauling hay bales. A farm mom is the first one out the door. To always ensure the future of our farm is bright. Sometimes so good, we have to wonder if it is real. And of course always makes sure her kids are never bored. That he will watch us carefully while he takes us working in the field. She takes care of them with such compassion and grace. Our farm mom will do whatever she can to make us well. And always make sure we are in presentable clothes. And teaches us to never be disrespectful or show greed. That to have a farm mom as a mom makes us the luckiest kids in the land. Always putting her family and farm first before herself, don’t you know? She can ease our worries and dry our tears. And chase away our deepest fears. A farm mom still continues to remain strong. She always stands firmly right beside dad. Because a farm mom is a real treasure. As we know your lifestyle is extremely tough. As a farm kid, there I one thing I can boldly say. My farm mom will always brighten my day. 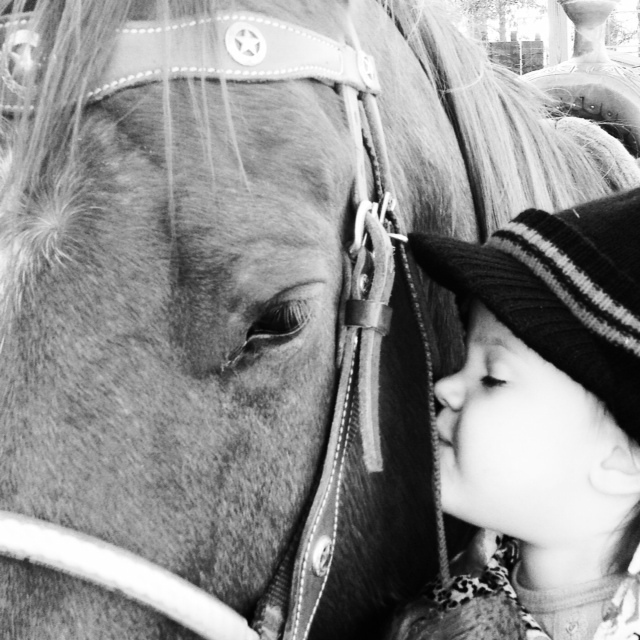 Please remember that as a farm mom, you truly are blessed. Thank you farm moms for everything you do. For being a great example and supporter, just to name a few. As you have shown me how the game of life is won. Please realize that there are truly none others that compare. 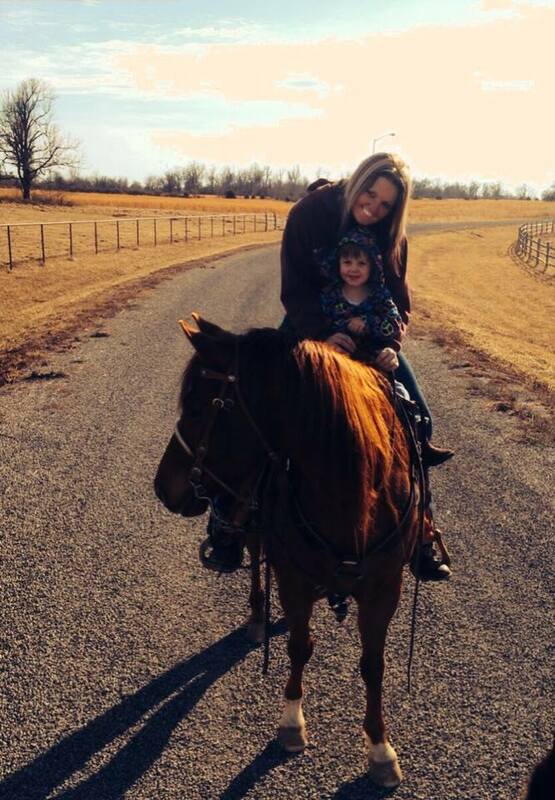 A farm mom is exactly who I want to be. Because you know you want a farm mom as a wife someday. 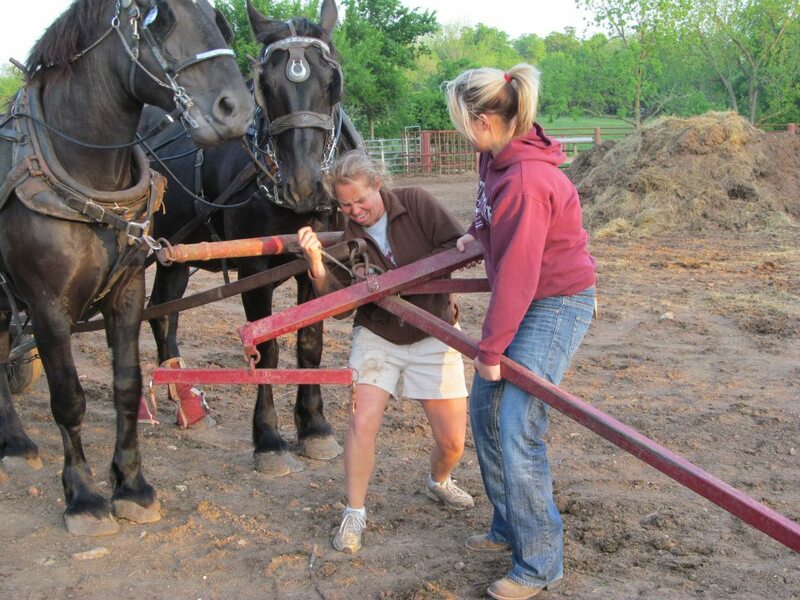 Farm moms are the best, and now you have an explanation why. As you can see, our farm moms do A LOT. It is my true hope that this poem can serve as a reminder to our farm moms out there that they are so amazing. I encourage you to share this poem with that special farm mom in your life. I cannot fully describe the roles farm moms play in farms and farm families all over the world. They really are some of the strongest women out there. 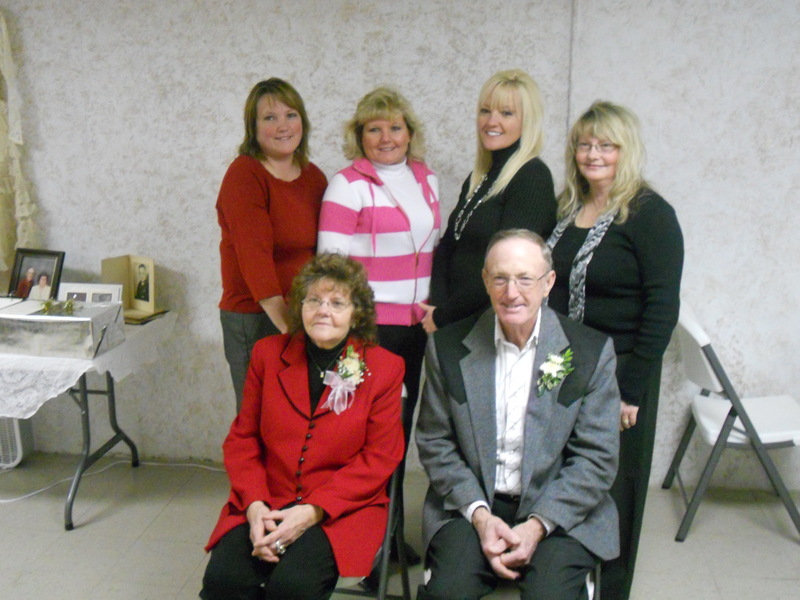 When I reflect on my childhood, I really cannot see how my mom was able to do so much for my family and our farm. A typical day for her would be to wake up early, do chores, fix breakfast, get us to school, come home, clean house, do laundry, help my dad with any other tasks around the farm, pay bills, get us to any activities/events we needed to get to, do evening chores, fix supper, help us with our homework, and the list goes on and on. 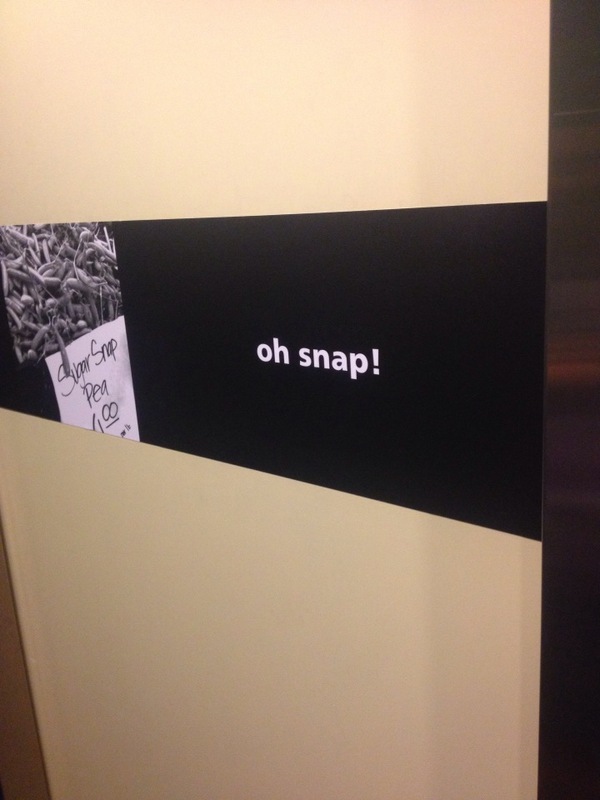 (Whew!!!!!) What is amazing about this? My mom never complained about her role. From what I understand, this is a common trait among farm moms everywhere. Farm moms, I truly cannot say thank you enough. Your hard work and efforts truly are appreciated. Even though you may feel a little underappreciated at times, let it be known that we really do not know what we would do without you. Your role is respected. You deserve much more credit than you receive. Always remember that! I also want to give a personal shout-out to my mother. She is my rock and the woman who has inspired me to be the woman I am today. I am so blessed to have her as a mother, and I thank God every day for her. 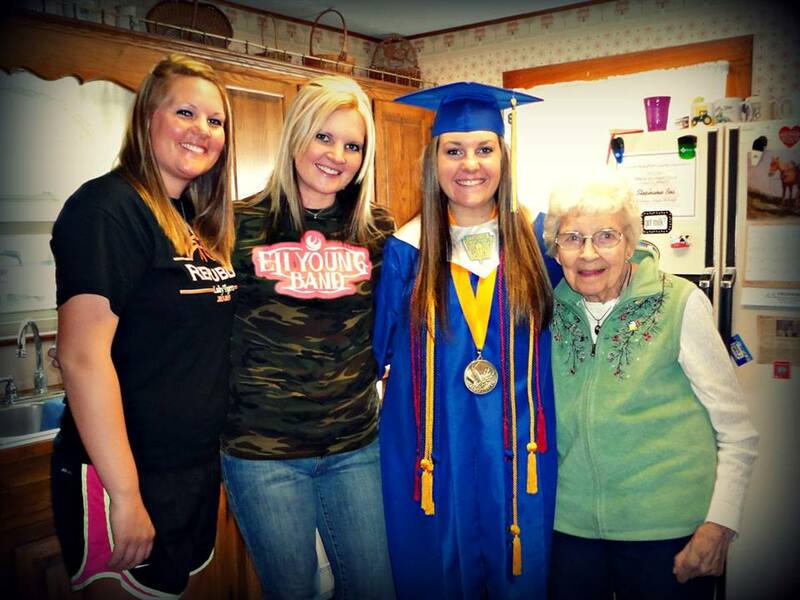 In addition, thank you for my grandmothers and my aunts for also being a positive role model, as well as excellent examples of how a farm mom should be. Happy Mother’s Day to every mother out there, especially to you farm moms. Enjoy your day, try not not work too hard, and take a moment to understand just how special you are. Until next time, and God Bless You All! We all have those “things” that just drive us plum crazy. Some of those things cause us to be late, cause us to spill a drink or just cause our day to go from bad to worse. Getting hung up at every stop light, getting behind that person driving slow in the fast lane, putting on a piece of clothing and realizing there is a huge stain or even realizing you are completely out of coffee. Bottom line is there are just “things” that frustrate each one of us to no end. So, since this is a blog dedicated to agriculture, I decided to come up with a completely randomized list of different “things” that specifically drive farmers crazy. Or better known as “Farmer Frustrations,” as I like to call them. For all of you farmers, you probably will be able to completely relate to this list. You will probably even think of several more. However, I just wanted to come up with a list to give everyone an insight as to what we have to deal with on a daily basis. • Let’s talk about those lovely garden hoses that we use each and every day to get water to our livestock or to our crops. 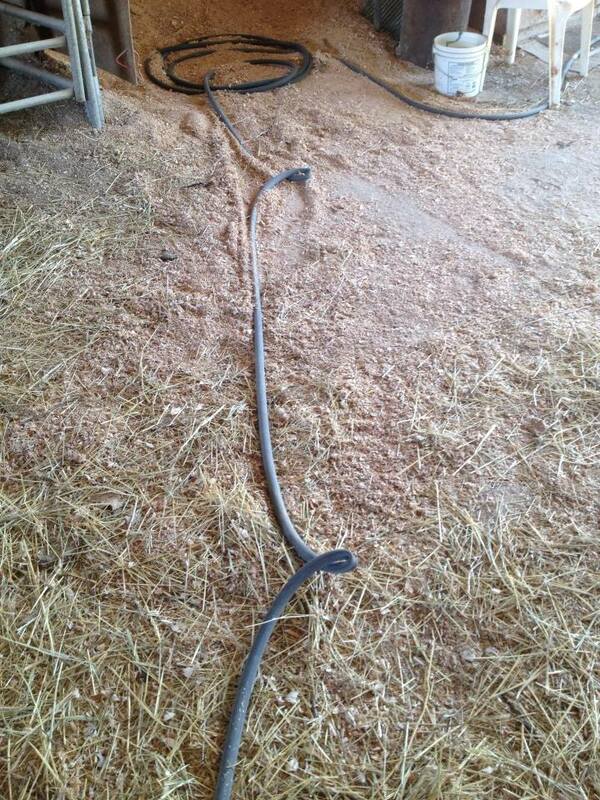 – There is hardly anything more frustrating than a hose that constantly gets a kink in it. That means you have to put down the hose, walk to the kink, walk back to the hose which is spraying water everywhere at this point which in turn gets you soaked. It happens all the time. – While we are on the subject of hoses, during the winter months, they are pretty much useless. And let me be the first to tell you that once a hose is frozen, it is going to be frozen for a while. • Now let us discuss the inevitable problem of forgetting to close a gate. Admit it. If you are a farmer, you have been victim of this mistake. – It seems as if you always forget to chain a gate when 1) you have places you absolutely have to be; 2) when the weather is not in very desirable condition ; and 3) it is to the pen where you have livestock that is the ones who don’t like being caught. • We’ve covered the topics of garden hoses and forgetting to close that gate. Now let’s move on to the subject of that complete feeling of despair when that trusty piece of equipment – whether it be tractor, farm truck or whatever else – won’t start. 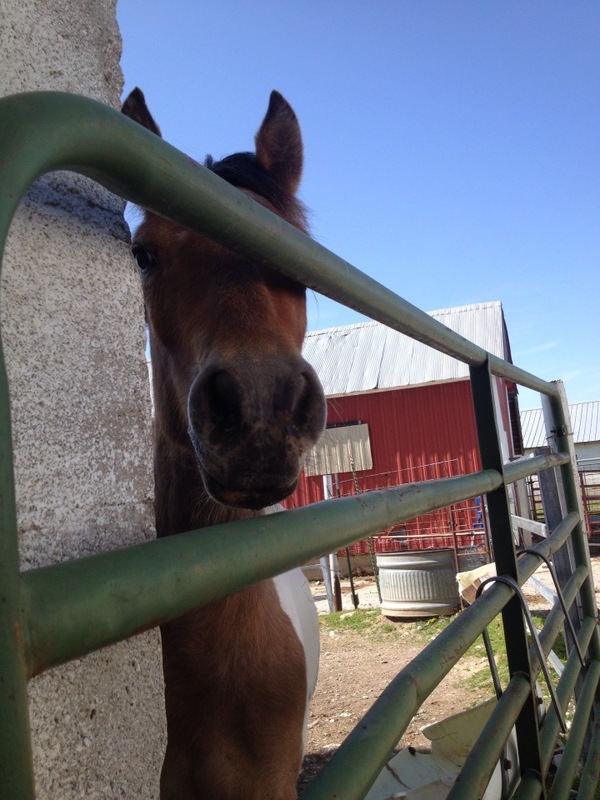 • Most farms require the feeding of hay. 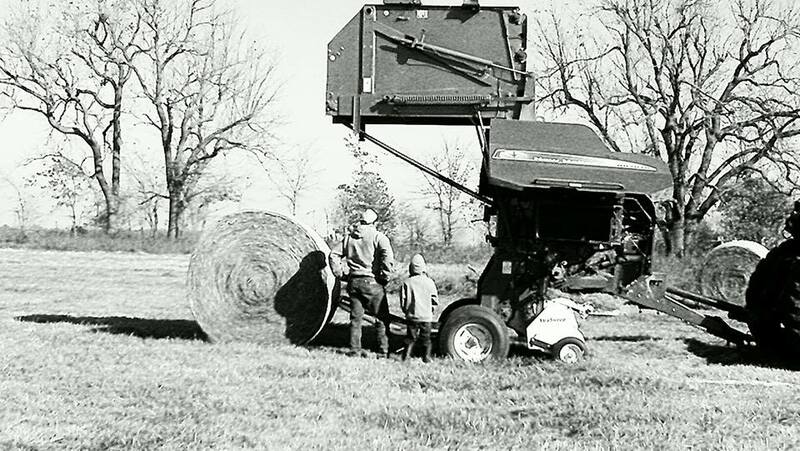 Many times, farmers have to feed bales of hay by hand. Nine times out of 10, when a farmer proceeds to throw that flake of hay to their livestock, the wind is always blowing from the opposite direction. What does this entail? This means the farmer gets completely covered in pieces of hay – in their eyes, hair, clothes, you name it. It is definitely not pleasant. – Also, have you ever been hauling hay and have a bale bust? 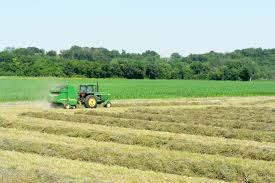 Bottom line is hay is a major part of livestock farms; however it does bring some headaches along with it. • We have already mentioned the frustration of leaving a gate open somewhere. 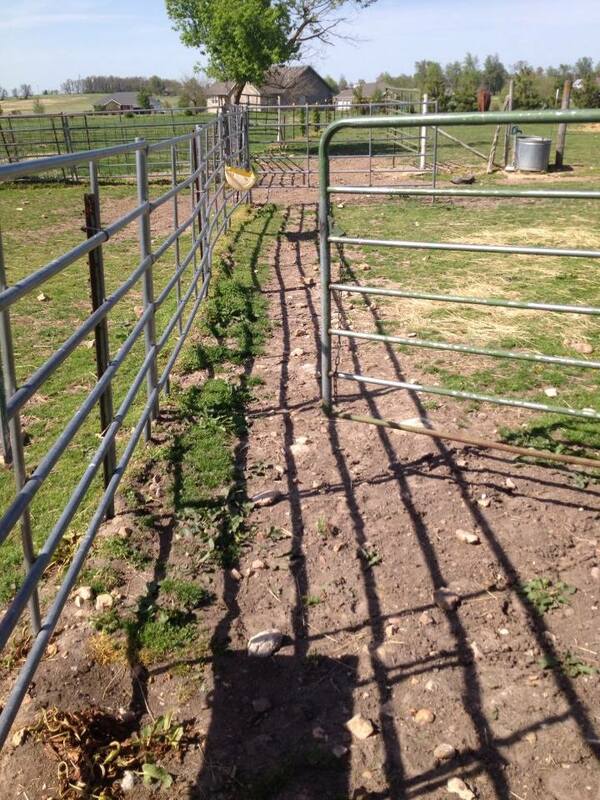 Now we can move into the frustration of fixing fence. 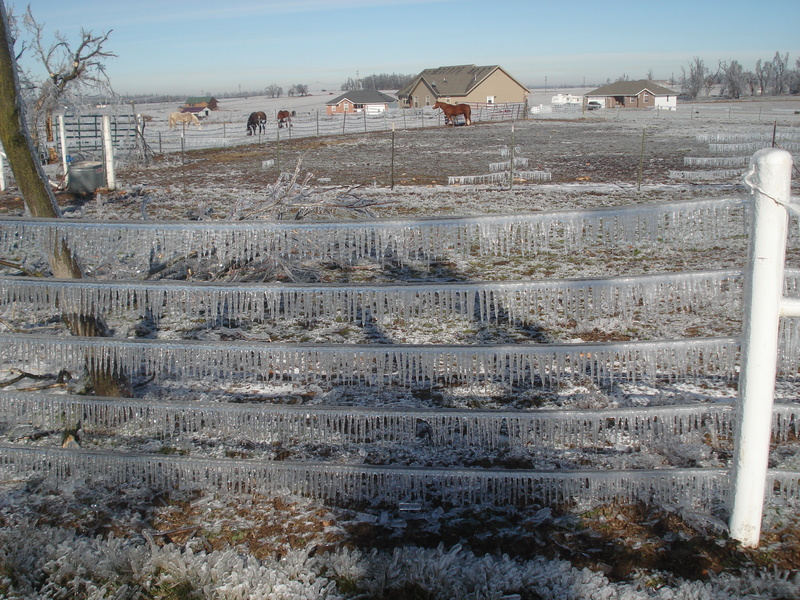 It is part of the farming life; however, there is hardly anything more frustrating than having to take time out of your busy schedule to fix fence. – I don’t know about you all, but any time I think of fixing fence, barb wire immediately comes to mind. 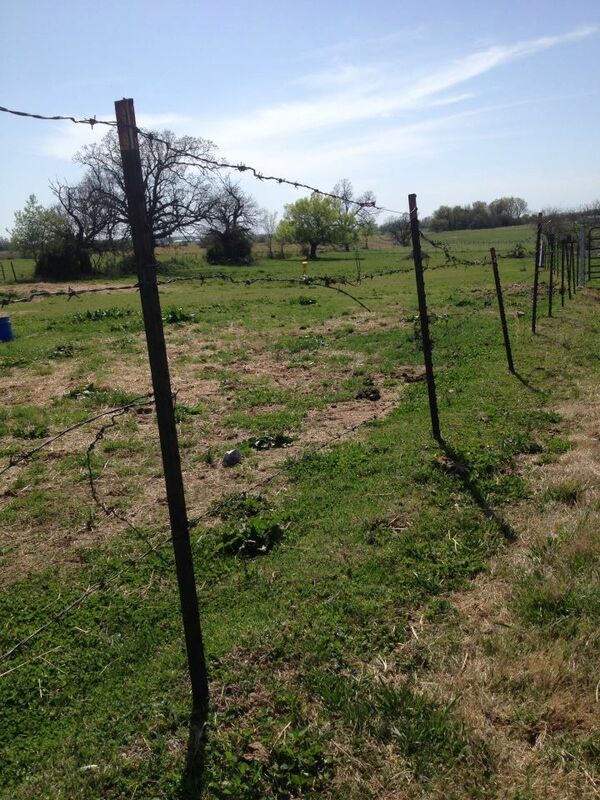 If you are a farmer, chances are you have been cut by a barb wire fence. It is pretty tricky stuff to work with! • Now let’s talk about those little annoyances provided by good ole’ Mother Nature. 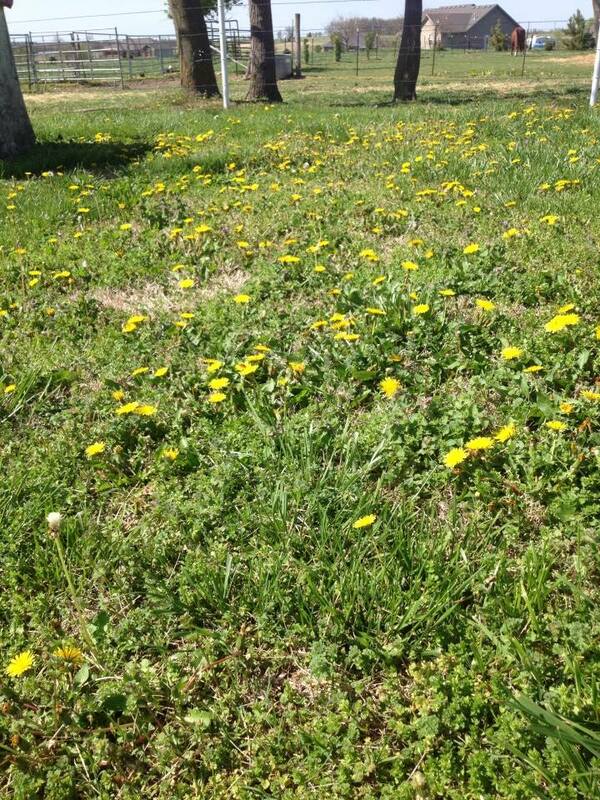 I’m talking varmints, weeds, and those kinds of things. Critters getting into grain, mice tearing up feed sacks, thistles taking over hay fields, weeds popping up in crop fields, the list goes on and on. These nuisances are once again, just a part of the life. 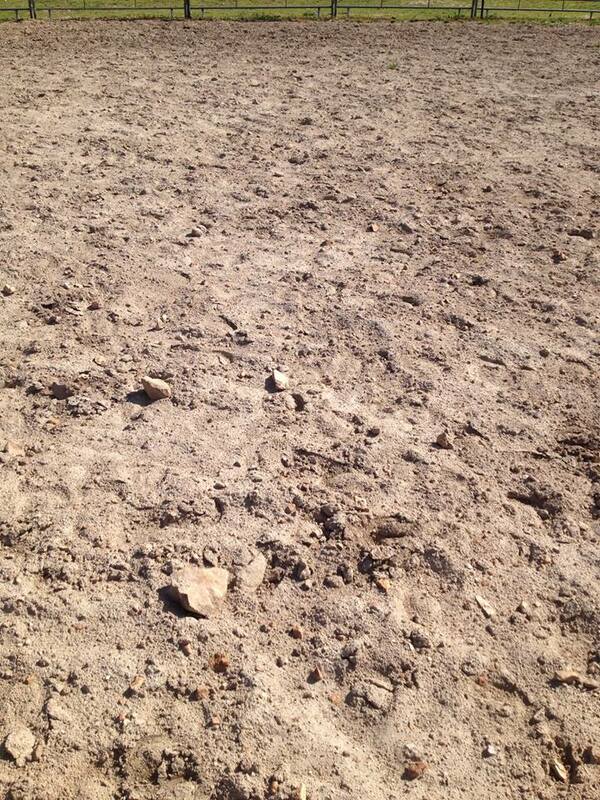 – I will also include rocks in this farmer frustration. Ever try to dig a post hole and have rocks get in your way? Pretty frustrating. Has a huge rock ever tore up a piece of equipment? Definitely frustrating! 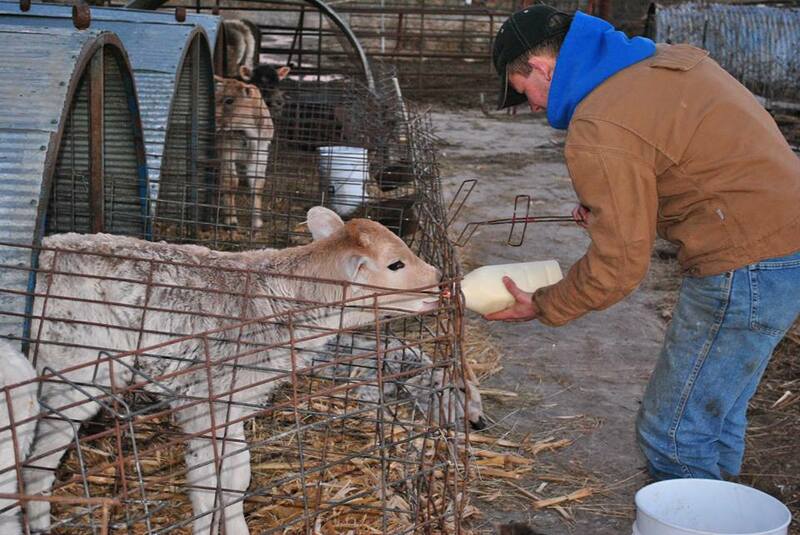 I will put this in here for everyone who has had the opportunity to raise a calf on a bottle. 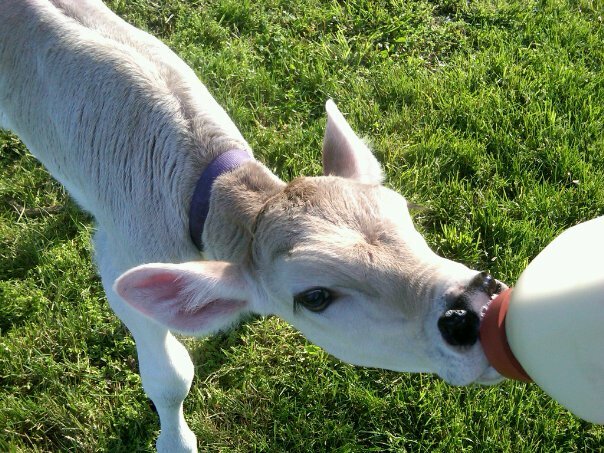 It seems as if there is nothing more frustrating than a calf who will not nurse from a bottle. Your back hurts from bending down to attempt to feed it. 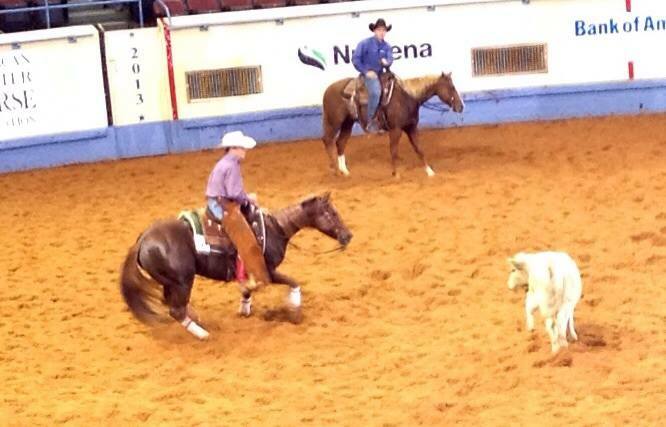 You want to give up, yet you know the calf needs the milk to survive. You feel oh so helpless, and oh so frustrated. Andddd when you do get it to nurse, then we have a whole new frustration to deal with… hunching. • Okay, now to move on to the next farmer frustration. This one is more of a serious matter; however I could not leave it out. This frustration is thievery. Farmers are the victims of so many cases of theft. 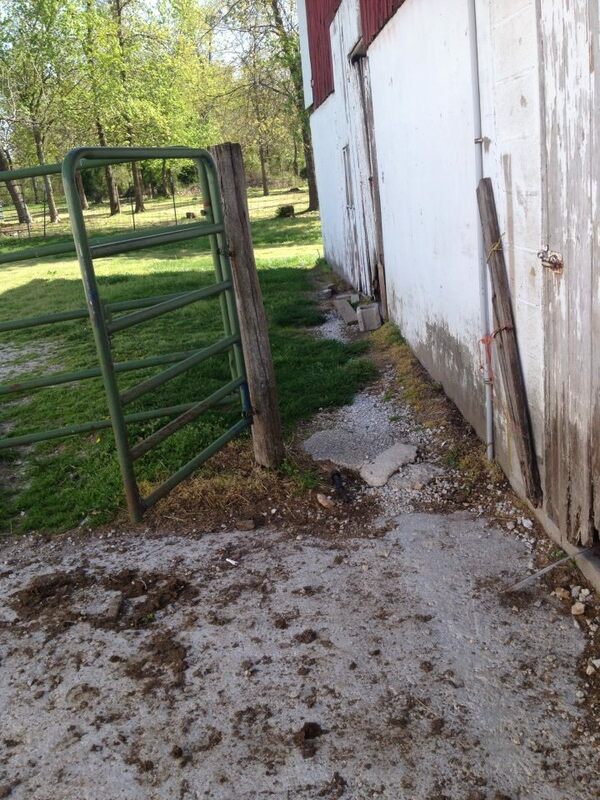 From livestock to equipment, thieves target farms on a regular basis. It is completely sick if you ask me! – I think I can speak on the behalf of many that if you are attempting to steal from a farmer and you get caught, I would hate to be in your shoes. (You would wish the police would have got to you first.) The fact is, farmers do not mess around. I hope this list has brought a smile to your face of has made some realize just a few challenges farmers face on a daily basis. There is no doubt that we all encounter frustrations on a daily basis that impact our daily schedule; however I just wanted to point out some specific issues farmers do face. Yes, these issues can make a person get mad, say some not so nice words and maybe even throw some things. However, at the end of the day we realize that things could always be much worse. At least that is what I was taught. So the next time that frustration presents itself, remember to take a breath and just smile. I know it is much easier said than done; however these frustrations are going to face us whether we like it or not. I hope you got some entertainment out of this! It was definitely an entertaining piece to write. If you can relate, feel free to share it! Also, leave a comment of a farmer frustration you have experienced on your farm or ranch. I’m sure you can list many more! In closing, I just want to point out that no matter how many “farmer frustrations” a farmer/rancher is faced with, they still have the dedication and commitment to keep pushing forward. Farmers are truly the most resilient people you will ever meet and endure so much in order to provide you (consumers) with an affordable, safe and wholesome food product. These frustrations may get in the way sometimes; however I know farmers would not trade their lifestyle for anything. As always, thank a farmer and God Bless You All! You know, we can read and write blog posts about growing up on a farm or living the farming dream. I want to take it a step farther. I want to honor those who have inspired us and given us the opportunity to grow up a farm kid and for some of us even pursue our own dreams of owning our own farm. So, I decided to write a letter dedicated to those who have instilled the farming/agriculture gene within us. Whether it is parents, grandparents or other family members, this letter is written especially for them. Several people ask me why I have chosen agriculture as an area to study and pursue a career in. What is the number one reason why I selected this industry to base the rest of my life on? The answer is my family. Thank you. 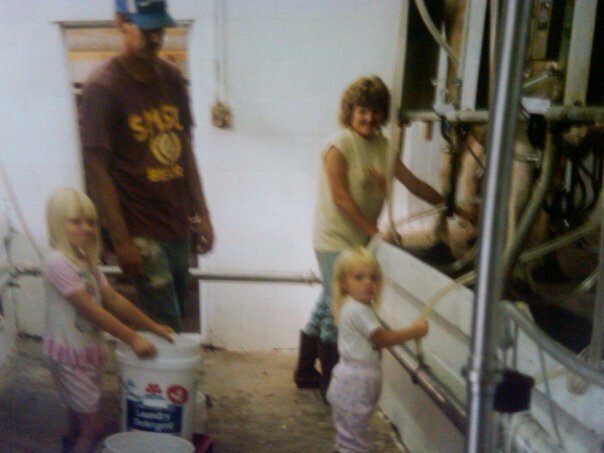 Thank you for giving me the opportunity to be born into a farming family. 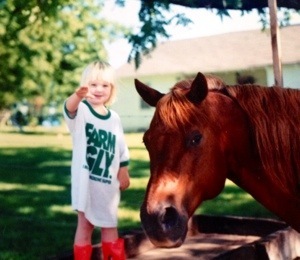 Thank you for allowing me to spend my childhood growing up on a farm. Thank you for teaching me about how important agriculture is. 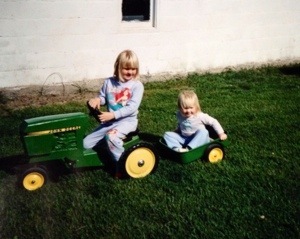 Growing up a farm kid has been such a blessing that I did not realize until later on in life. I learned about how hard work is important and about taking responsibility. I learned that there is nothing more peaceful than a country sunrise/sunset or more rewarding than watching a newborn animal be born. On the flip side, we learned that life is not always fair. Losing animals, witnessing accidents, experiencing years of pure bad luck… I learned early that I should never take anything for granted. I learned that I should never give up. 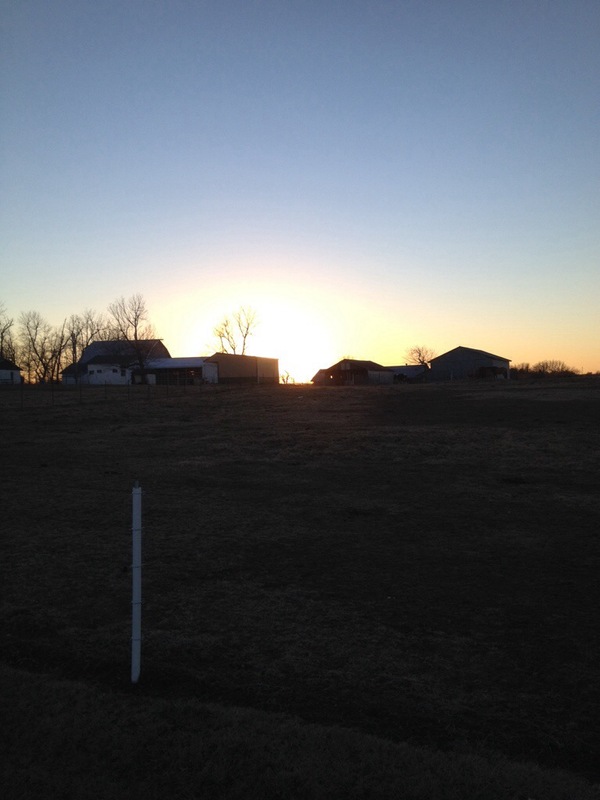 Most importantly, I learned that there is so much more to farming than what meets the eye. Farming is an important part of every single person’s life. As I grew older, I may have seemed as if I was unhappy with our lifestyle. I may have groaned when you made me go outside in the freezing cold to check livestock or when I had to get up early in the morning to go feed. I would get upset if I could not go out with one of my friends because we had hay to bring in or work around the farm to be done. I know it appeared like I did not care; however little did I even know, I was actually just getting molded for my future. 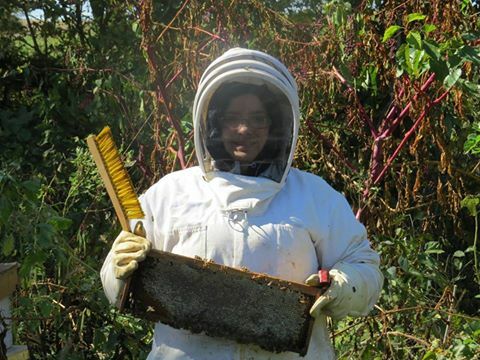 When the “real world” got closer, I realized that farming and agriculture is in my blood. I am just as passionate about it as you are/were. I realize that I want to make it my future because you have made it apparent to me that farming is important and agriculture was my future. It truly is the only way I know; therefore there is no doubt in my mind I want to be a part of the industry for the rest of my life. 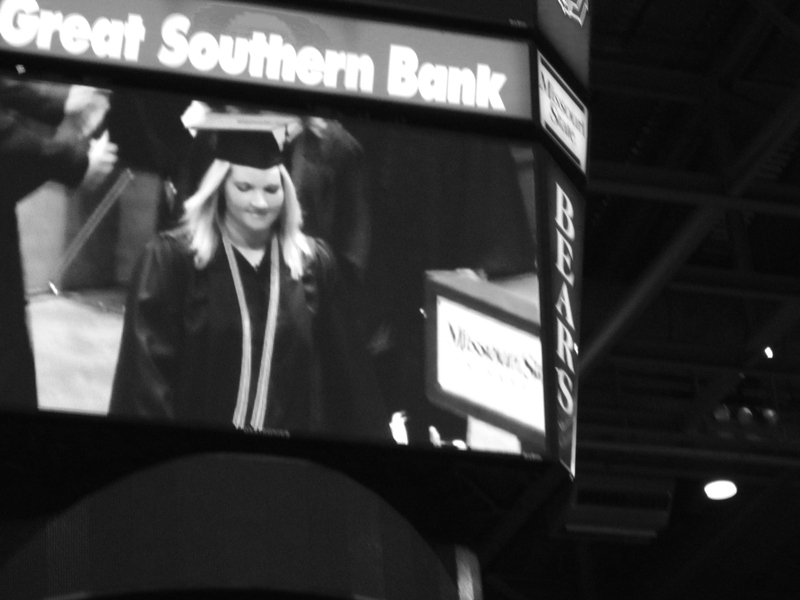 The moment I realized that was one of the most refreshing and relieving feelings I have ever felt. Yes, I do realize that this lifestyle is not easy. It is not a career that holds guarantees. It is not something by which I will be able to make so much money that I will live in a mansion or drive a fancy vehicle. Truth is, I know there will be times when I will wonder how I will survive or get by. There will be times when I will feel like I have run out of options. There will be droughts, floods, storms, blizzards and other natural disasters that will affect my career. There will be years when fuel/feed prices are high and my output prices will be low. There will be several obstacles that will stand in my way. With each day, there will be new challenges. You have shown me this. You have taught me how to handle it. You see, I have learned from you. I have been watching you. I have been taking mental notes. You have been my mentor and my role model. During times of hardships, I have noticed how you never gave up and how you always found a way to keep your head held high. 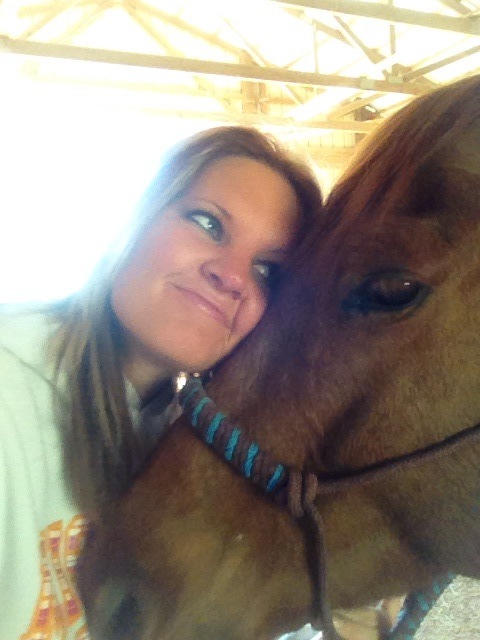 The stress, the tears and the heartache… It is all inevitable in this lifestyle; however you have taught me that the passion I hold for the farming lifestyle burns strong enough to fight the fear of giving up. Your example of strength and courage through those hard times has been engrained in me. I am prepared because of you. On the flip side, the joy you had made me realize that you loved what you did. You were happy, and I realized how I want to be happy too. How would I be happy? By following in your footsteps and following the farming dream. Let’s talk about those good times a little more. 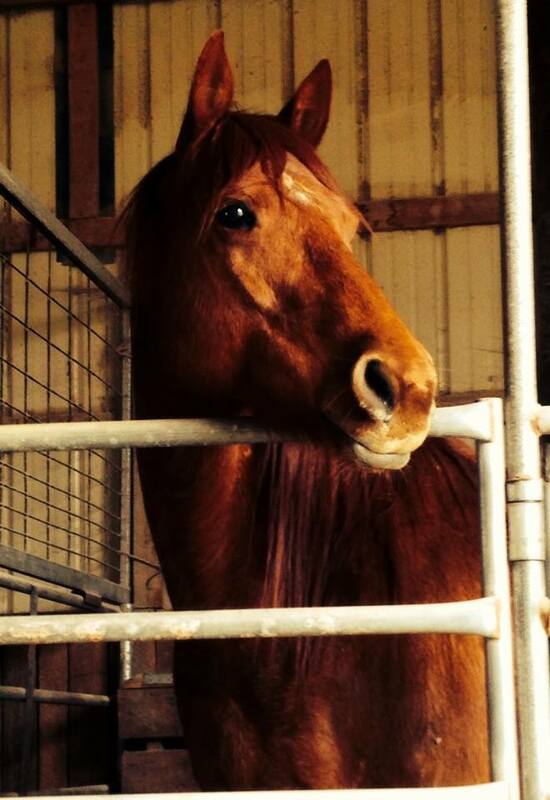 I will never forget the look on your face after a good harvest or after you saved the life of an animal. 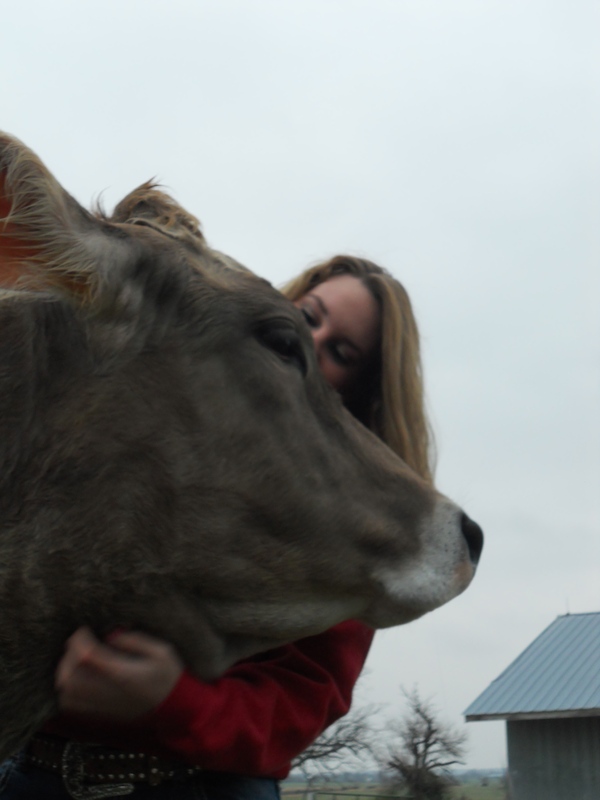 You have taught me that along with the heartaches, there is great joy in farming. We had so many good times, so many laughs and so many precious memories made. From the moment when I drove the tractor for the first time by myself to the moment when you left all responsibilities on the farm to me when you left for a few days, there were so many moments that I will never forget. 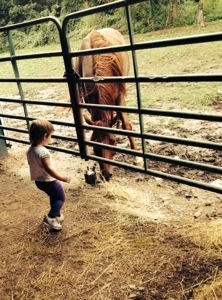 This is what the farm life is truly all about. This is what has inspired me to follow the same path you did. I want to experience those things too. I want to experience it all. During the good times and the bad, I know I must always remember why I chose this lifestyle. I chose it because 1) I want to keep my family’s tradition alive; 2) I want to do my part in keeping food on peoples’ tables all over the world; and 3) I could not imagine my life being any other way. You are the ones responsible for this mindset. You have taught me so much and I am so thankful for that. 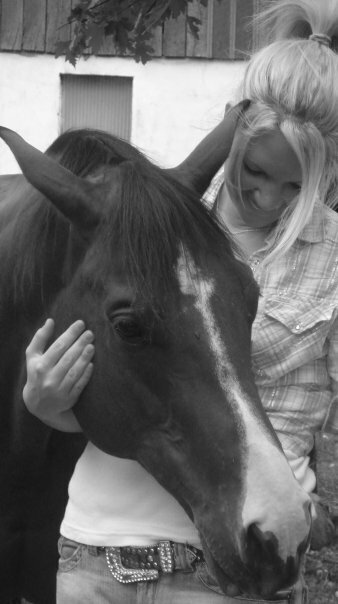 I could easily go on and on; however I want to end with the valuable lessons and responsibilities you have taught me. 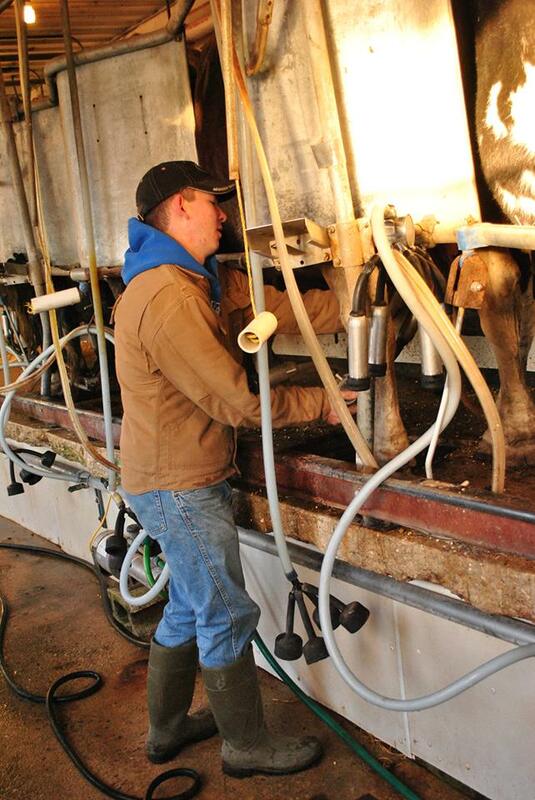 First of all, to be able to make a living in the agriculture/farming world, I must be passionate about what I do. Secondly, I must be resilient and willing to push forward, even when the future looks doubtful. Next, I will not be successful unless I am willing to work hard and remain dedicated, as well as committed. I must also make farming a priority. Lastly, I must always keep a strong faith and pray to God constantly for the productivity, safety and well-being of my operation. Faith in farming is so important! 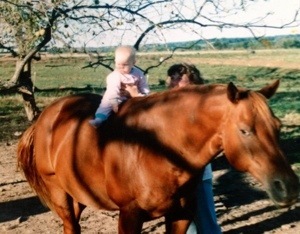 Thank you again for raising me on a farm and inspiring me to continue your tradition. 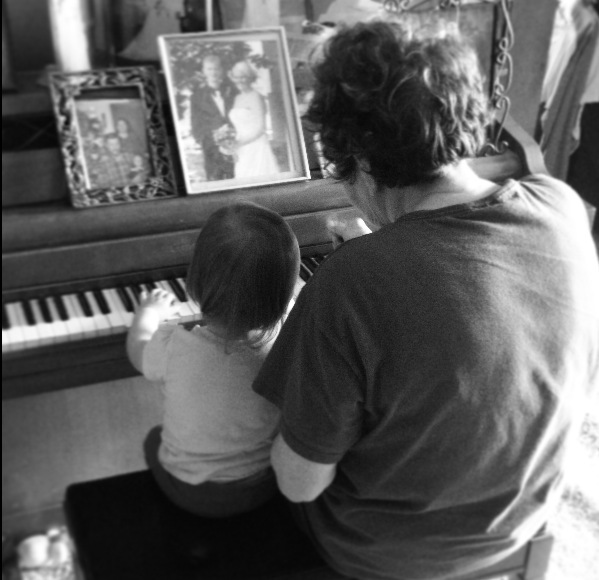 Thank you for allowing me to realize that I want my own kids to someday experience what I did. Thank you for laying down a pathway for my future. Most of all, thank you for being a great role model that I will aspire to be like every single day. 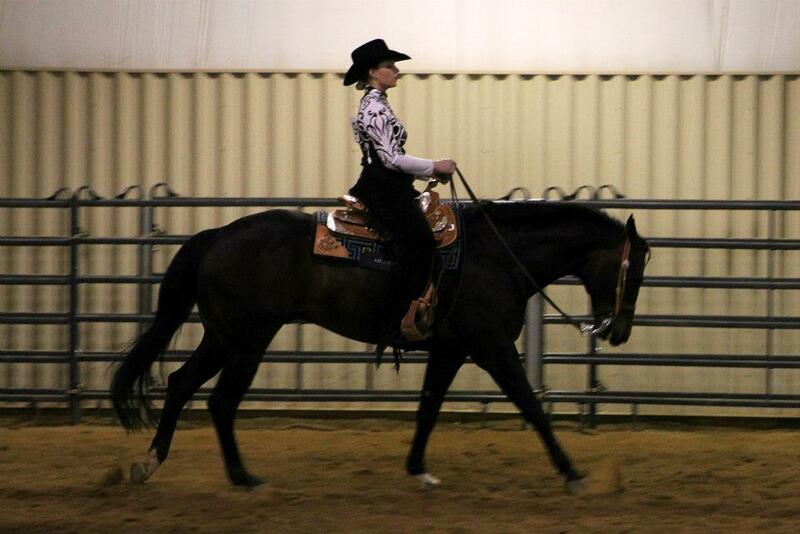 I love this life, and I could not imagine it any other way. I seriously cannot thank you enough. If you are thankful for growing up in a farm family, share this with those who have influenced you. Share this with your friends so they can realize just how valuable this lifestyle is to you. So many people do not realize how much more there is to farming and how much the farm life teaches us. We are hard-working, passionate and driven individuals who are responsible for feeding the world. Until next time, God Bless our Farmers and God Bless You All! Yes, I know there are a lot of posts like this floating around out there. There are several different scenarios that define us country folk. However, I felt like it was time to put a Missouri twist on this and tell the world about how it is growing up in the country in rural southwest Missouri. I know that you country people all around the world can relate to most, if not all, of these truths. 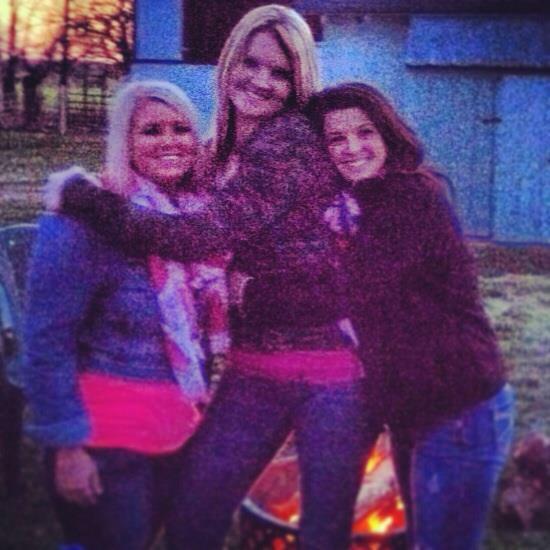 Being country is a true blessing, there is no doubt! Whether you grew up in the country, you still live in the country or both, you know there are things that make us different. There are some things that make us stand out. Yes, there are stereotypes. Yes, there are those out there who give country a bad name. However, we cannot let these things get in the way of being proud of our lifestyle. This list could have easily gone to 100 truths, but I decided to stop at 28. As you read this, I encourage you to take a trip down memory lane or just take a moment to appreciate the country lifestyle. Feel free to comment to add to this list because I know there are so many more truths about living the country life. 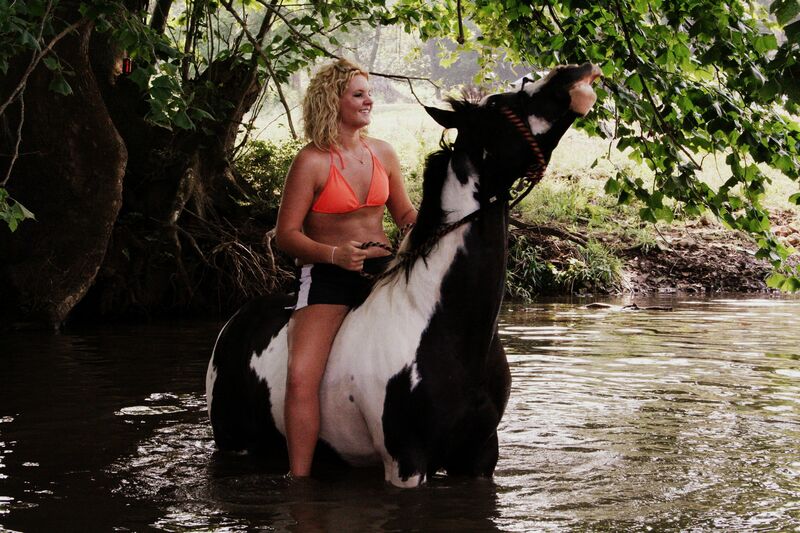 So, sit back and enjoy these 28 truths about living the country life. 1. There is nothing, and I mean nothing, prettier or more refreshing than being able to look up at a star-filled sky. No smog, no city lights – just the glow of billions of stars against a clear, black sky. 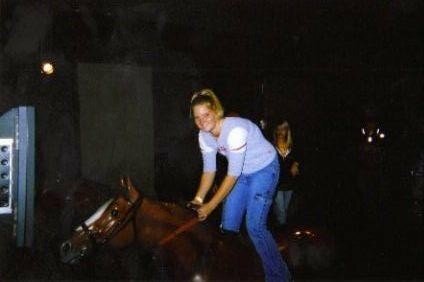 On nights of a full moon, well that meant the opportunity for a moonlight horseback ride or just another excuse to have a bonfire. 2. You looked forward to the months of May and June. Not just because of warmer weather, but because it meant hay season. That meant driving the back roads with your windows down so you can fully enjoy the smell of freshly cut hay. We all know there really is no better smell than that! 3. Even though it may add 10 extra minutes on your drive time (also known as taking the scenic route), you would drive as many back roads as possible to get to your destination so you would not have to deal with heavy traffic and crazy drivers. 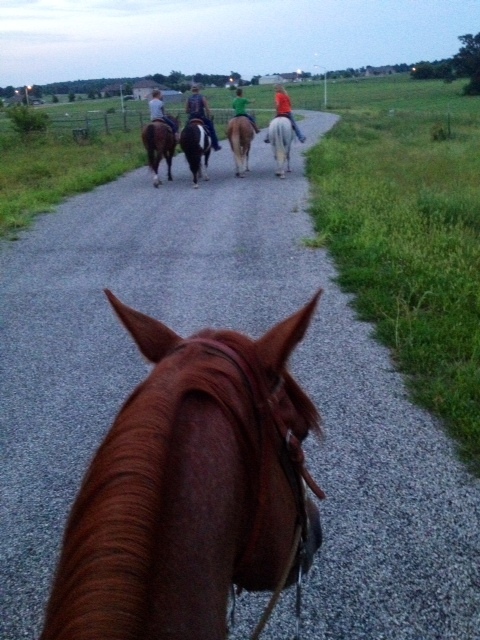 Plus, this gave you the chance to enjoy the country scenery. 4. To this day, you cannot stand drinking “city water.” The only water you would drink came from a well. There is nothing better than that stuff! 5. While we are talking about drinking water, you do not care what “experts” say about the dangers of drinking from a water hose. You do/did it anyways because it is just SO good. 6. You have been stopped by two or more locals stopped in the middle of the road talking. Do you get annoyed? No. Shoot, in most cases you turn your flashers on, get out and go join the conversation. 7. Family gatherings, weddings and other major get-together were planned around the following: chore time, huntin’ season, calving season, harvest season, etc. That is just how things are done. 8. A date night between a country girl and a country guy did not consist of dressing up on going downtown to a fancy restaurant in a big city. A good date night consists of either going to a local movie theatre, drive-in, cruising the back roads, going fishing, sitting around a bonfire or just hanging out on the tailgate of a pick-up truck. 9. When you got behind a tractor, combine or other piece of farm equipment on a road, you never get mad or annoyed. 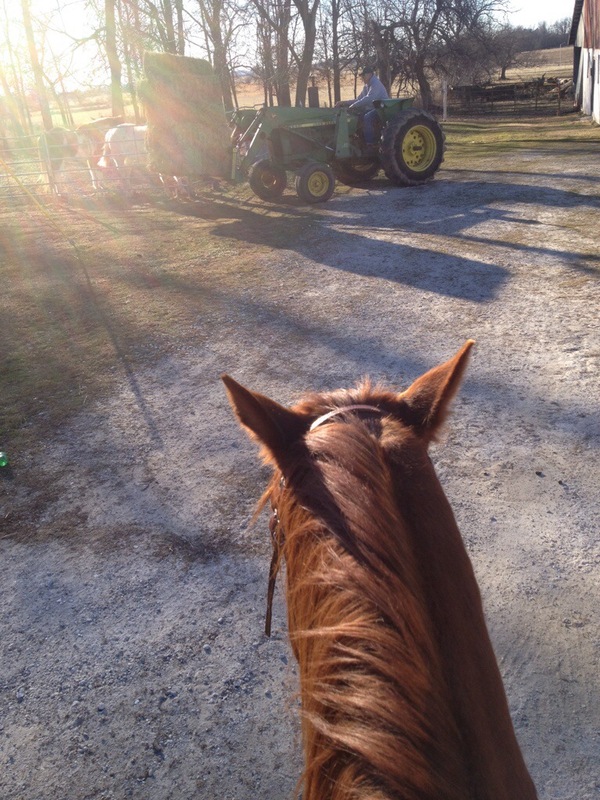 You actually kind of enjoyed it because you did not mind admiring a good piece of farm equipment. 10. You did not go to the city pool to cool off on a hot summer day. You went to the closest creek. 11. 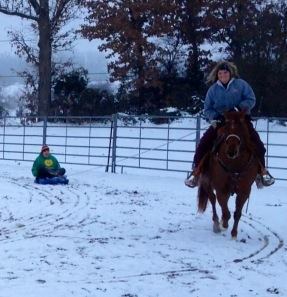 Your idea of fun on a snow day did not mean going to some small hill and sledding down it a few times. 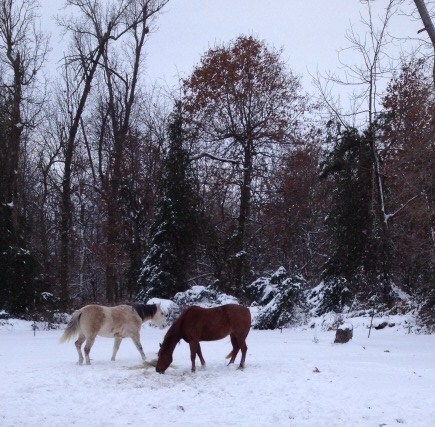 Your idea of fun usually involves trucks, 4-wheelers or horses pulling a sled (or something similar) in a wide open field. 12. You literally cannot stand being confined in a big city, or any city for that matter. Big cities drive you insane – sirens, car horns, traffic, etc. You just are constantly ready to get back home where you can enjoy some peace and quiet. 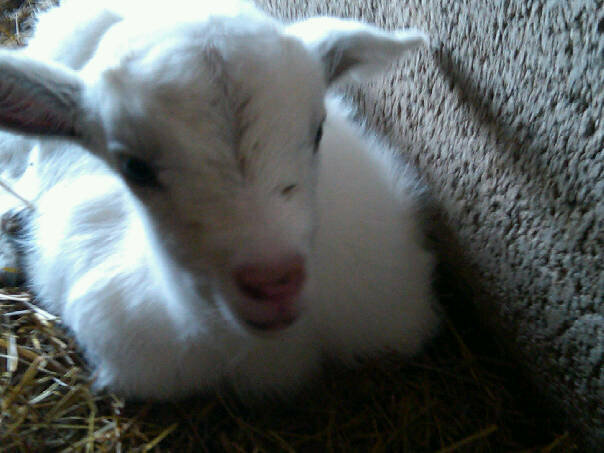 Yes, we had someone dump a goat close to our farm. So, we took her in. 14. 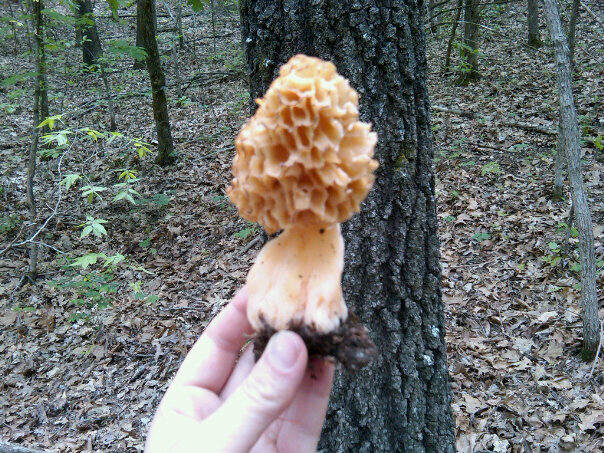 Quality family and/or friend bonding time occurred at the following: hauling hay, hunting Morel mushrooms, fishing, gathering walnuts and cutting wood. Even though some of these things are not exactly “fun,” you actually looked forward to them because you get to spend time with people you really care about. 15. 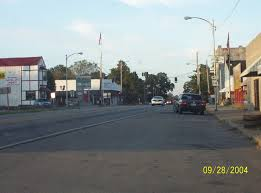 Living in the country meant you did not trick-or-treat like kids in the city did on Halloween. Trick-or-treating meant loading up in the family car and driving countless miles to all of your neighbors. If you did not show up, they would be calling asking where you were. 16. You always look/looked out for you neighbor. If they had cows out, you stop to help get them put back in. If they had a tractor break down, you would offer them yours. If they needed help getting hay hauled in before the rain came, you would drop what you were doing to go help. 17. When there is crime going on, country people really come together. Thieves and trespassers are NOT tolerated. Neighbors look out for neighbors; it is as simple as that. 18. 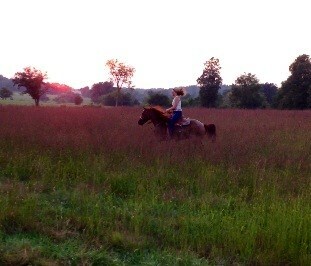 There is seriously nothing more beautiful or amazing than a country sunrise or a country sunset. You can never imagine not living somewhere where you could not enjoy either of these. 20. The sound of frogs, crickets, owls, coyotes, etc. are like music to your ears. Those sounds beat the hustle and bustle of the city any day. Speaking of music, country music really is where it’s at. 21. 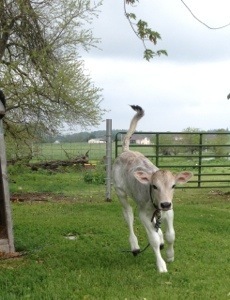 When neighbors would hear you got something new – new tractor, new farm equipment, new cows, new horse, new car, etc. – they would find an excuse to come over so they could check it out. 22. Hunting season, especially deer and turkey, is like a major holiday. 23. Being involved in 4-H and FFA is an honor and is something you just do. 24. This is how you could tell time without a watch or looking at a cell phone: when the school bus would go by; when the cows started moving; the noon whistle (all of my Billings, Mo. readers will understand this! ); when the neighbor dog would return from his rounds; this list could go on and on. 25. 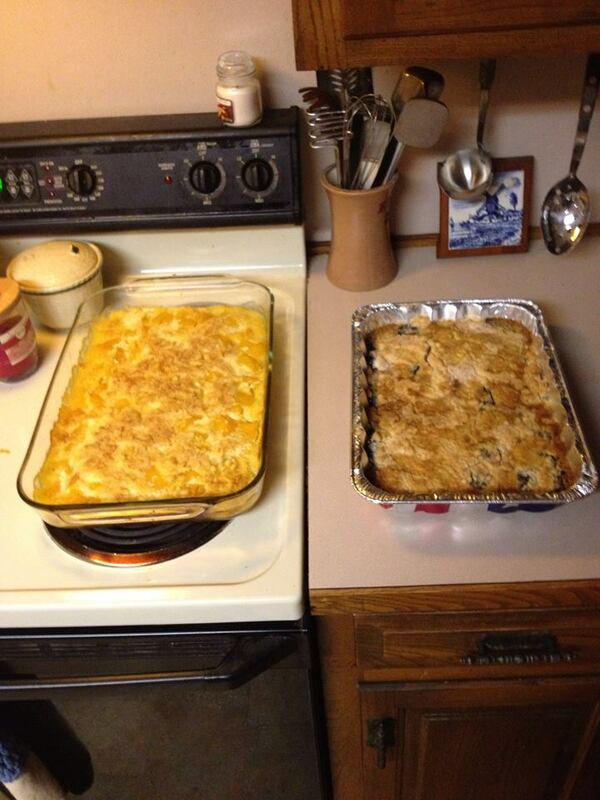 There was no better meal than that of one prepared by your mama or a country girl. Fried chicken, fresh fish caught from the local pond, mashed potatoes, vegetables from the garden, sweet sun tea from a Mason jar, homemade ice cream and blackberry cobbler. That is how it is done in the country. 26. Going to school meant several things. A) being tardy because a train stopped you, you got behind farm equipment, you had trouble with your livestock, etc., were totally acceptable. B) You had to drive a minimum of 5 miles to even get to school. C) You have driven your tractor and/or rode a horse to school on at least one occasion. D) If you rode the bus, you usually were the first one on in the mornings and the last one on at night. 27. You realize you will never leave. 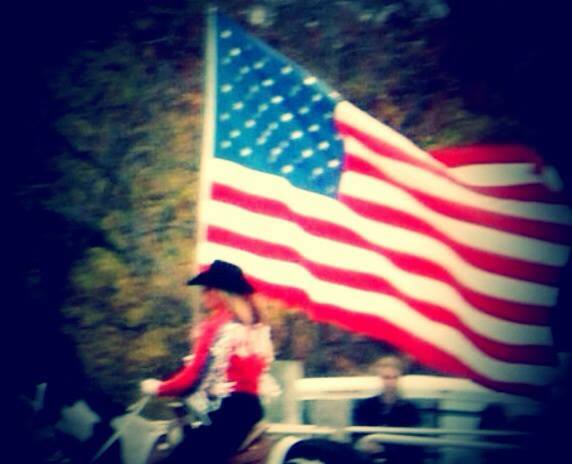 Country is in your blood. You want your kids to enjoy the country life and you know deep down in your heart that there is no way you could live anywhere else. 28. 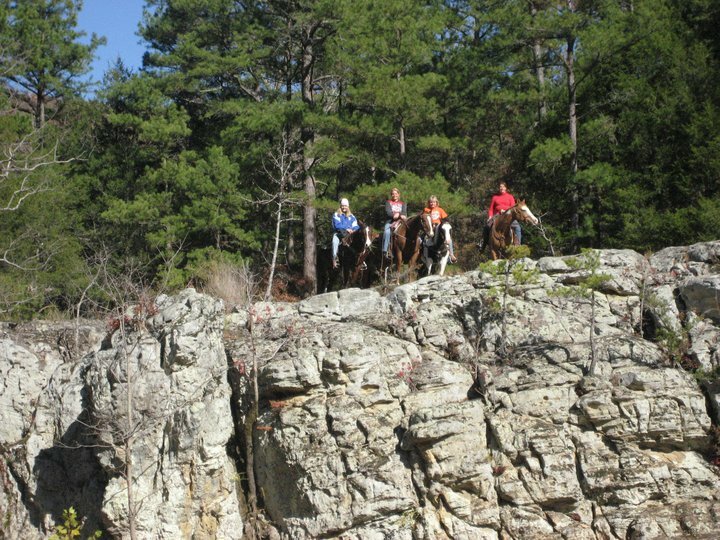 You fully understand that being country is not defined by your wardrobe, what you drive or your hobbies. 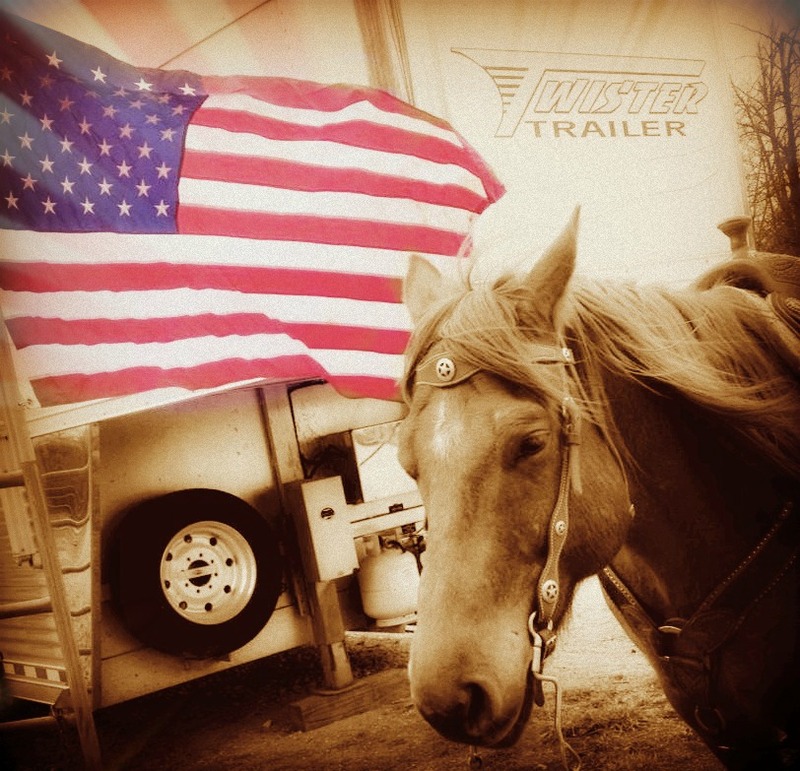 Being country is a lifestyle and is a true privilege. Yes there are some out there who think they are “country;” however, you know in your heart that you are country through and through. 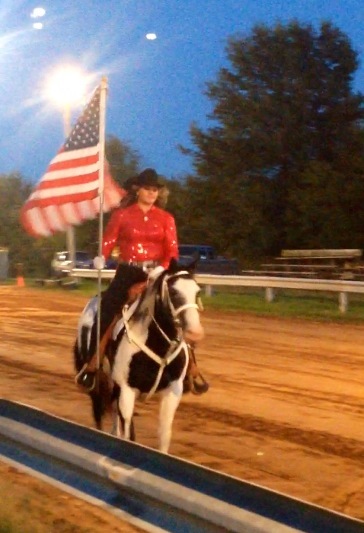 You have no doubt that country defines you now and always. As you can see, the country lifestyle is pretty unique. There definitely is nothing like it. Being born a country girl is something I thank God constantly for, and I am sure the rest of you country girls and boys think the same way. I hope you enjoyed this new list of truths about the country life. If you can relate, please share this with your friends! Let’s show everyone just how lucky we are to be true country folk. Attention: This is not directly affiliated with the National FFA Organization. This post simply reflects my own personal experiences while I was a member in this wonderful organization. This post was created to show the world just how awesome FFA is, and how many opportunities it provides for students. Facebook continues to block this post, so I just wanted to write a disclaimer showing that this is my own beliefs and personal experiences. Thank you! Just like farm kids, I believe those involved in FFA are truly lucky individuals. Being a part of an organization that is agriculture-based is a blessing in itself. You are learning more about the industry that we rely on to survive, while growing as a person and learning skills that will benefit you your entire life. 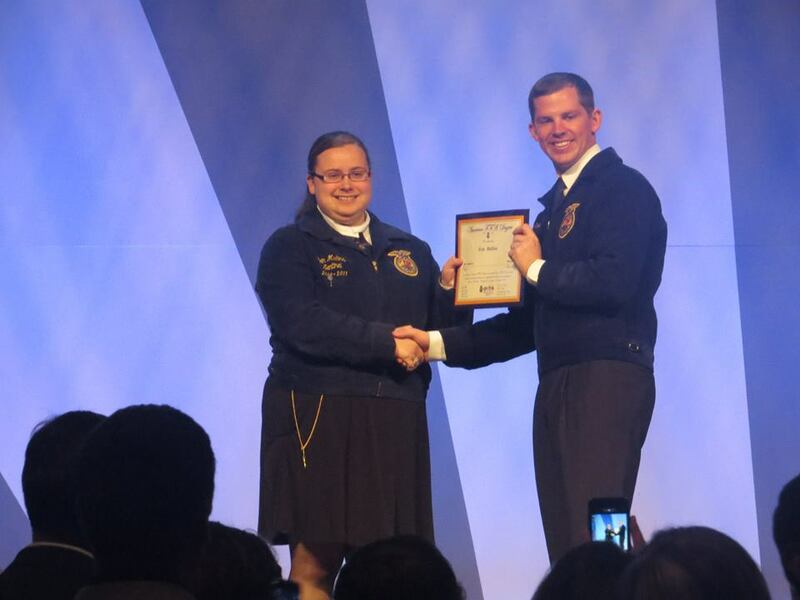 FFA becomes truly becomes your passion and inspires you to be better. You want to be involved. You want to be successful. You want to grow as a person. You want to learn more. FFA inspires you to want to do more. 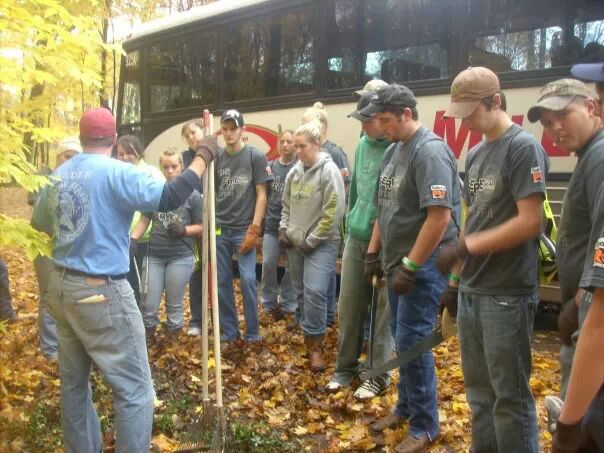 The FFA motto, “Learning to Do, Doing to Learn, Earning to Live, Living to Serve” really holds true. “Today, there are 579,678 members aged 12-21, in 7,570 chapters in all 50 states, Puerto Rico and the U.S. Virgin Islands” (www.ffa.org). After thinking about how remarkable the National FFA Organization is, I came up with a list of truths about being an FFA member. This list could easily went on and on; however I picked out 25 truths that really display the lives of FFA members. For several of you, be ready to take a trip down memory lane, nod your head and smile as you read this list. For others who may not be familiar with FFA, be ready to learn more about it, as well as be inspired to become involved in some way. Learning teamwork at Area Officer Institute at Camp Rising Sun in Missouri! 1. 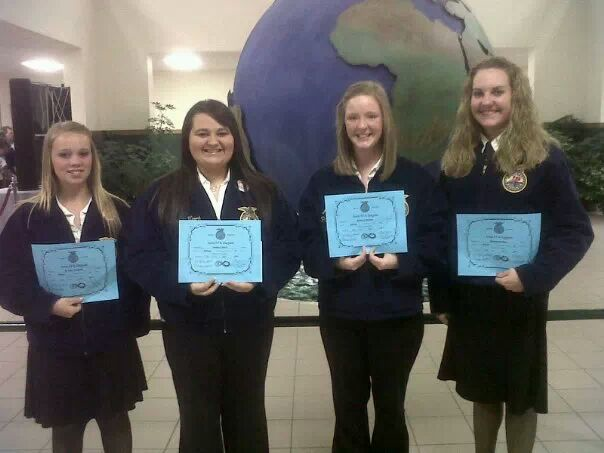 One of the highlights of entering high school was finally getting to become involved in FFA. You have been chomping the bit to finally get to participate in contests, go on trips, etc. You were sooooo ready! 2. Becoming a new FFA member meant 1) ordering your very own FFA jacket; 2) beginning your record book; 3) learning the FFA Creed; and 4) learning FFA knowledge. 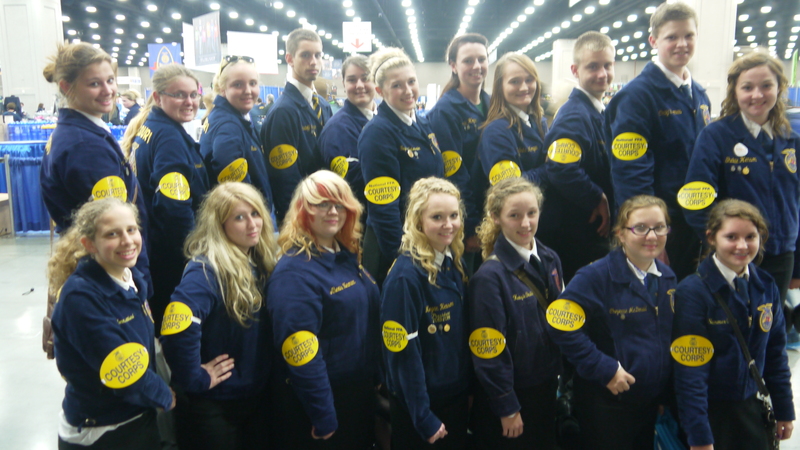 FFA members serve on Courtesy Corps at Convention. 3. Ordering your very own FFA jacket was a huge deal. (Who would have thought a blue corduroy could make a kid feel so giddy?) For many of us, it was the first official jacket that had our name on it. At the time, little did you know, some of the best memories were to be made while you wore that jacket. These memories are those that you will cherish the rest of your life. 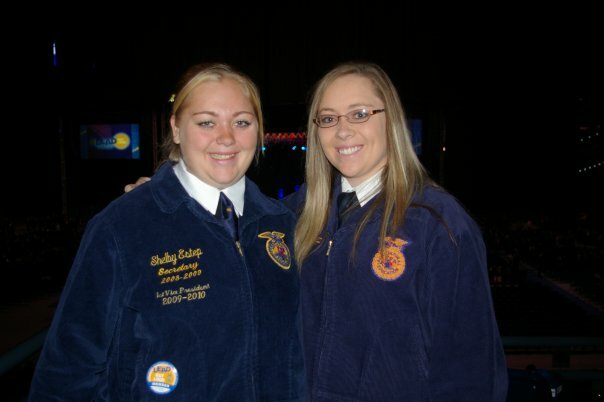 Cheyenne Estep with her sister Shelby at the 2009 National FFA Convention. 4. The FFA manual became your best friend. Learning about history, the meaning of the emblem, parliamentary procedure, official dress and much more became knowledge that you never really forget. 6. Beginning your record book usually meant utter confusion and chaos. You also asked the question, “Why do I have to do this?” at least once. Despite the stress and confusion, this book ended up being a vital part of your FFA career. 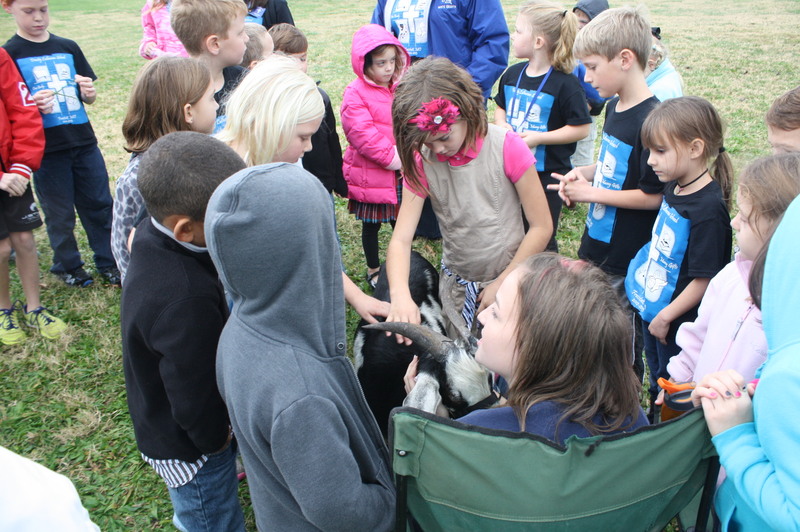 Goats can be used as part of FFA members’ SAE projects. 7. You are told to choose something for your SAE (Supervised Agriculture Experience). 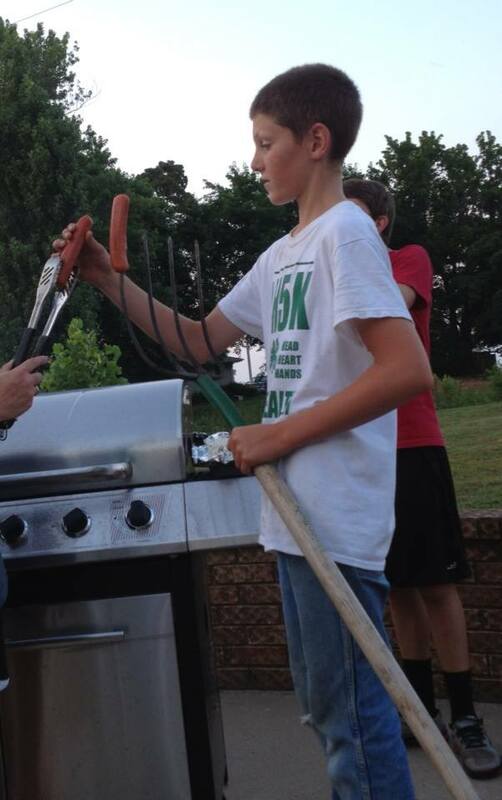 Little did you know that your SAE would teach you so many life skills. Record-keeping, organization, management, finance and responsibility were just a few skills you learned. Plus, you had documentation of how your hard work really pays off. 8. 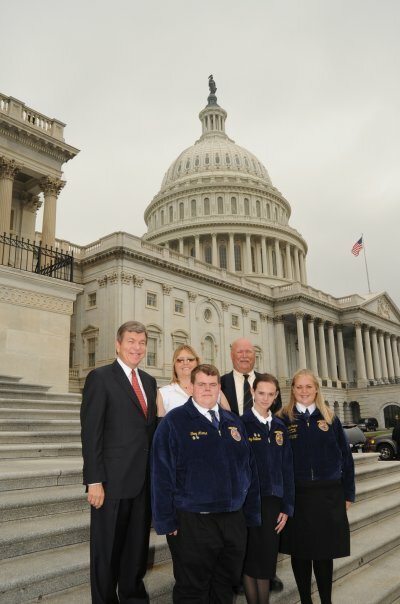 Let’s talk more about those FFA jackets and official dress. Yes, official dress sometimes got annoying; however you always ended up wearing it with pride. Ladies: official dress gave you the excuse of having to purchase pantyhose before the age of 18. Gentleman: official dress allowed you to learn how to properly tie and wear a tie before you got out of high school. 10. Being an FFA member meant the opportunity to travel. A lot. Conventions, WLC (Washington Leadership Conference) held in Washington D.C., workshops, contests, the list goes on and on. How many other organizations can offer opportunities like this? 11. 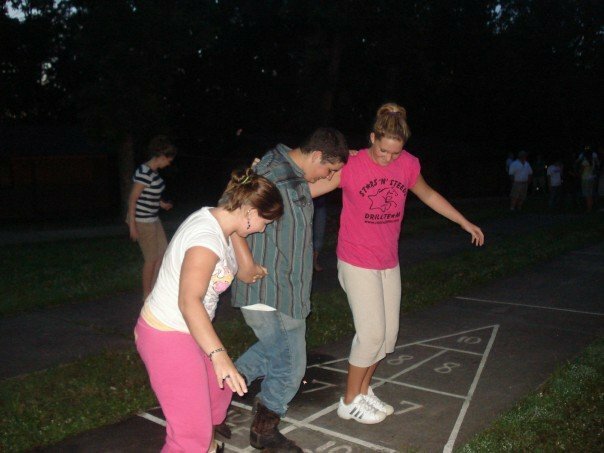 Being involved in your FFA chapter meant participating in a variety of events and activities. 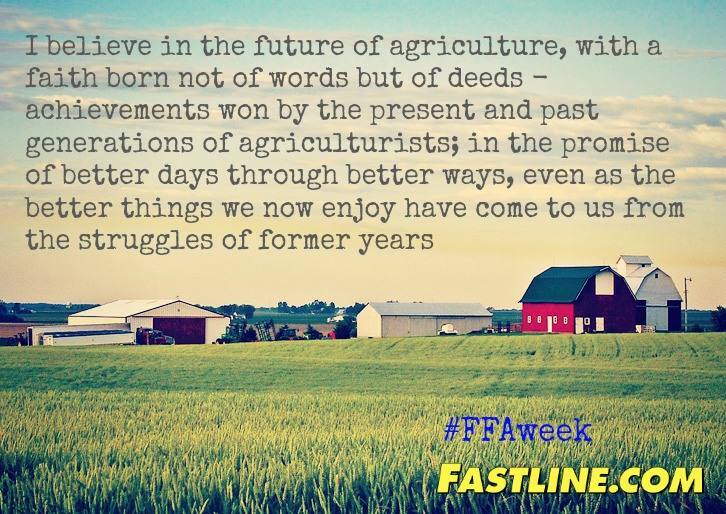 Food for America, FFA Week (where many had the excuse to drive their tractor to school), barnwarmings, fruit sales, etc. Teaching elementary students about agriuclture. 12. You were beyond excited to participate in CDE’s (Career Development Events). Yes, you were excited to travel and let’s be honest, have a reason to get out of school. However, CDE’s benefited you in more ways than you realize. To be successful, you had to put the time in. They also allowed you to conqueror any fear you may have had about public speaking. 13. CDE’s often meant spending many early Saturday mornings at workshops. Even though Saturdays were your day to sleep in, you still would wake up to go because you knew that you needed the practice. 15. 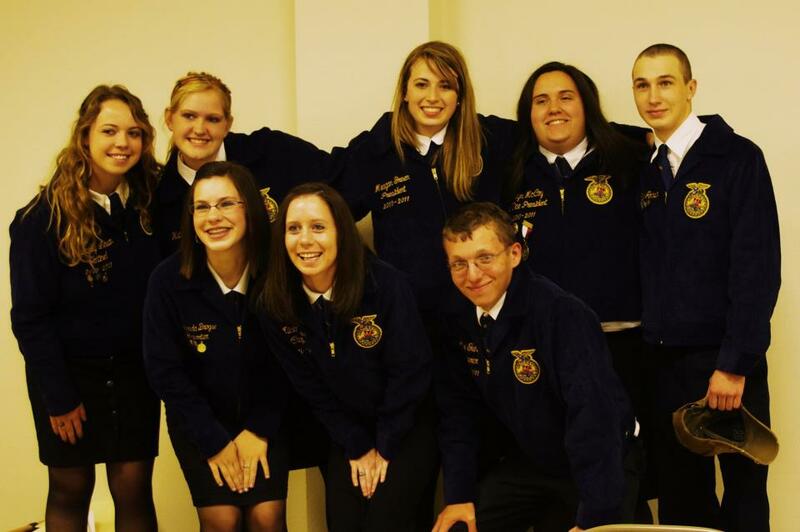 As you progress through high school, you begin realizing how lucky you are to be involved in FFA. Highlights of the school year almost always include FFA. You begin building friendships that are destined to last a lifetime. You begin realizing how much opportunity you have to succeed, as well as discover what talents you have been blessed with. 16. Your FFA advisor turns into one of your mentors. Most of us can honestly say that our FFA advisors were different than other teachers. It is hard to explain, but you really do not see them as teachers. They become your role model. Plus, how many people can deal with a group of high school kids on long trips without completely blowing a gasket? Yes, our FFA advisors are truly one of a kind. 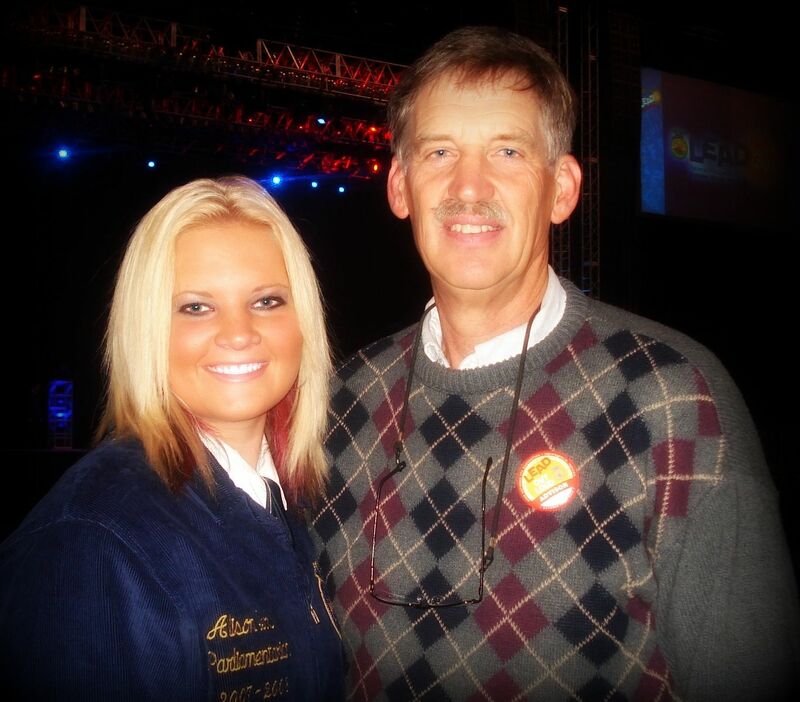 My dad was my FFA Advisor! 17. 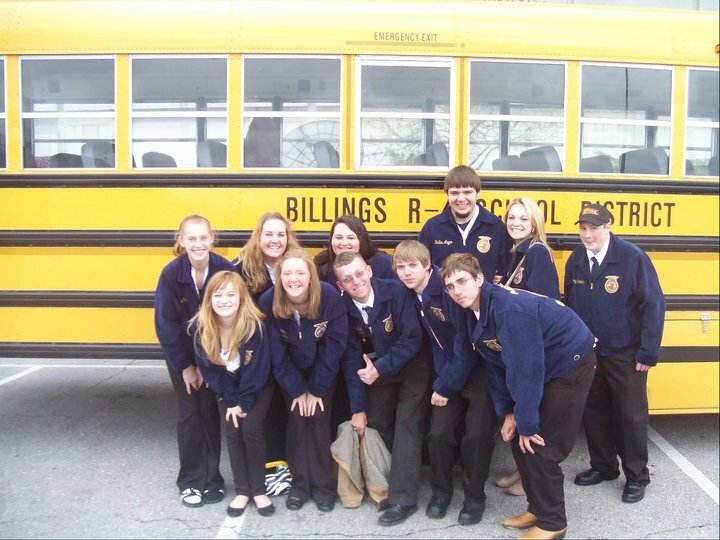 FFA members spend a lot of time in those big, yellow school buses traveling to activities. This means even more opportunity to make memories with your friends. (And in some cases, see how far you can push the patience of your advisor.) You make some great memories and share a lot of laughs while on these buses. Plus, your bus becomes a country music jam session when a good song comes on the radio. 18. 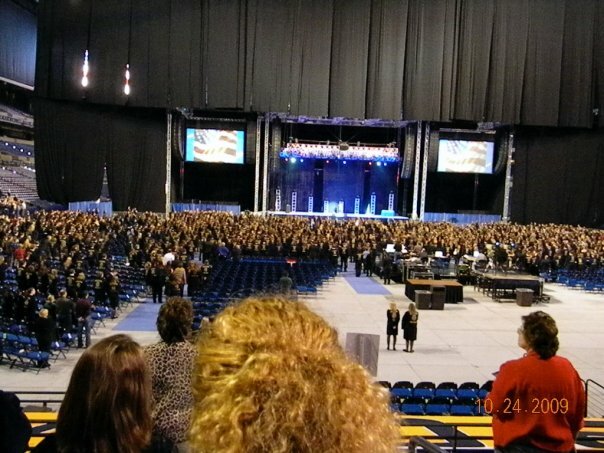 Being able to go to the National FFA Convention was a HUGE deal. Many do not realize how big these conventions are. Plus, you make memories with friends that you will never forget. Most of the time, convention also meant traveling to other neat places. In Louisville- Churchill Downs and Louisville Slugger; and in Indianapolis: Indianapolis Motor Speedway and the Lucas Oil Stadium. 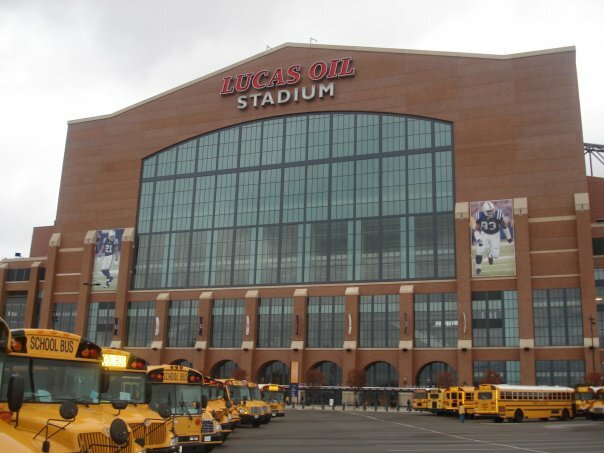 Lucas Oil Stadium, Home of the Indianapolis Colts and the American FFA Degree Ceremony when National FFA Convention is held in Indianapolis. 19. When you hear the phrase “sea of blue,” you do not think of an ocean or body of water. 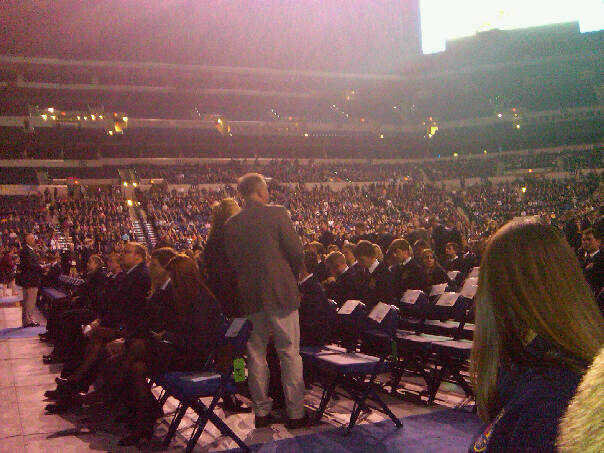 You think about all the blue jackets you see at national convention. 20. National conventions equal the opportunity to go to HUGE trade shows. 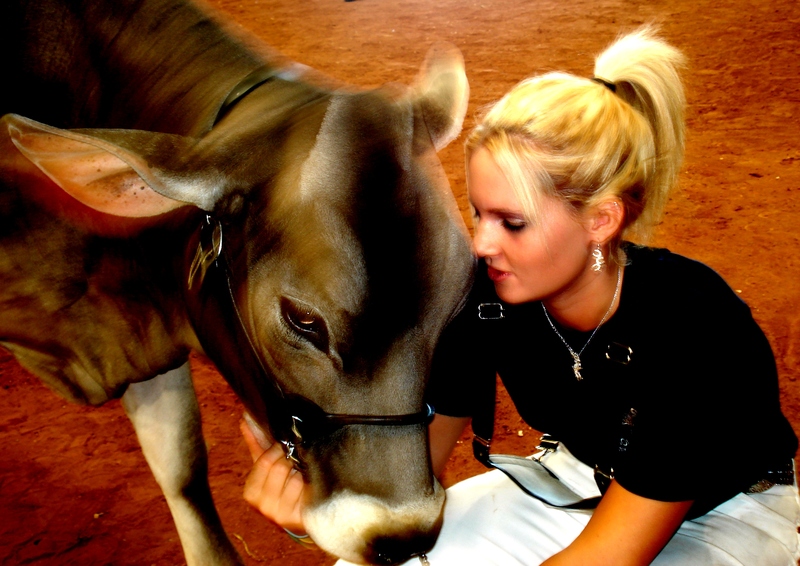 These trade shows allow you to learn about various agricultural schools, companies and organizations, as well as allow you to get a lot of “free stuff” and even meet celebrities. They are so fun! 21. As you get closer to graduating high school, you begin striving to win a proficiency award for your SAE. You have worked hard and when your proficiency wins area and goes on to state, you realize that hard work does pay off. For the few who win state and go on to nationals, the feeling of accomplishment is beyond compare. 22. 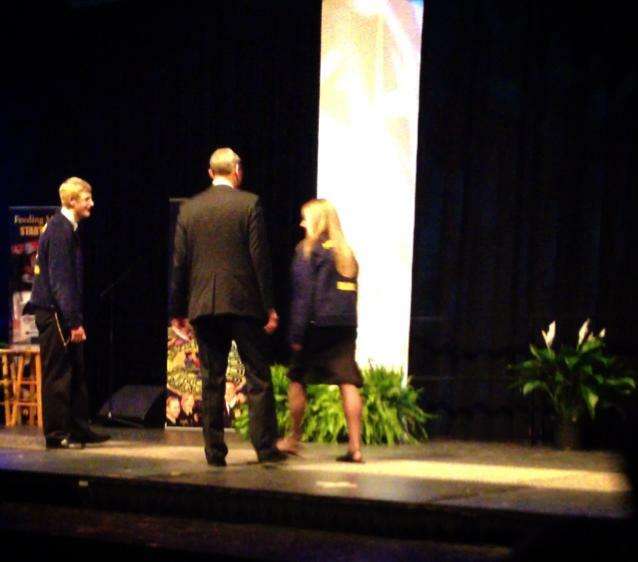 Finding out you will be receiving your State FFA Degree is sort of like winning state in an athletic event. (Okay, maybe that was not the best analogy to use, but it is a big deal!) You have that “I did it” feeling and are beyond excited to walk across the stage at your state convention to receive your degree. 23. The American FFA Degree is the highest achievement an FFA member can receive. Receiving this is seriously one of the greatest feelings ever. You know you made your chapter proud, your parents proud and your community proud. Walking across that national stage hearing the screams of your parents, friends and members of your FFA chapter is something you will never forget. American FFA Degree Ceremony. Congrats Erin! 24. 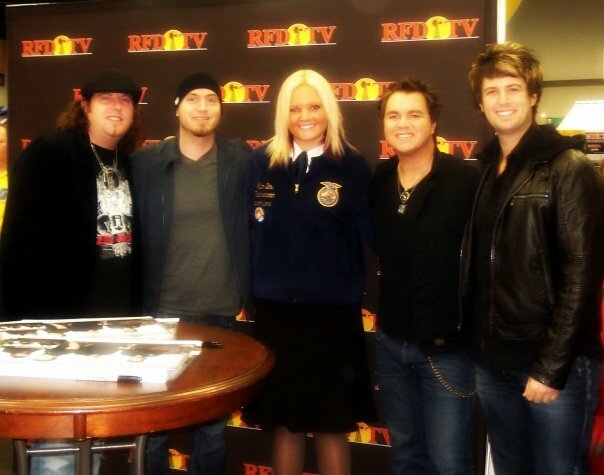 The last time you wear your FFA jacket is a bittersweet moment. 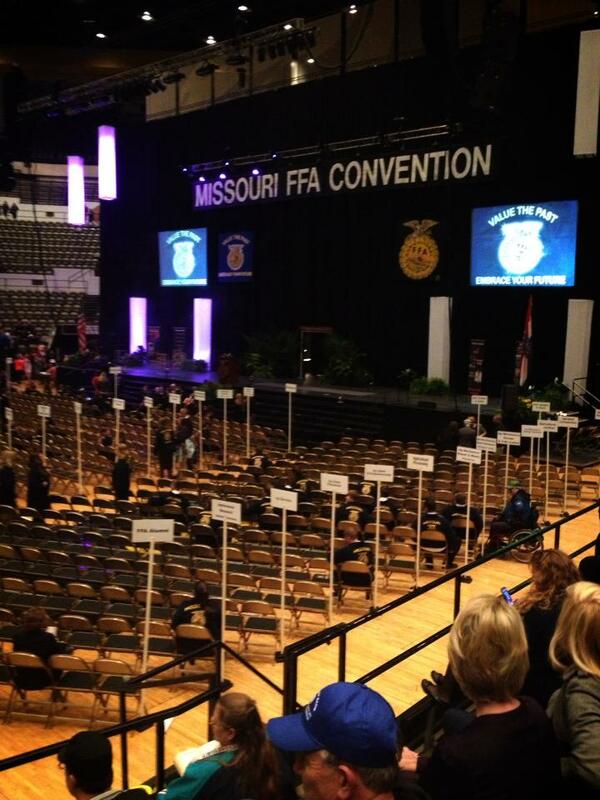 You realize just how much you will miss everything about FFA. (Do not be surprised if you shed a few tears.) 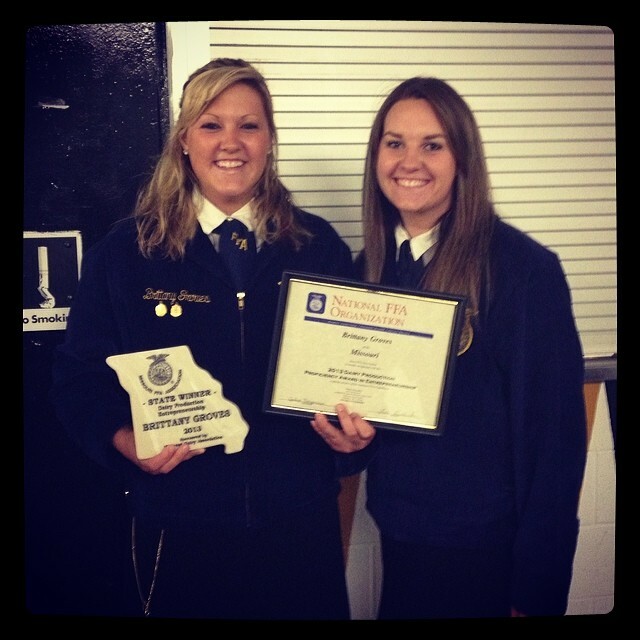 You realize just how much FFA did for you and molded you into the person you are today. 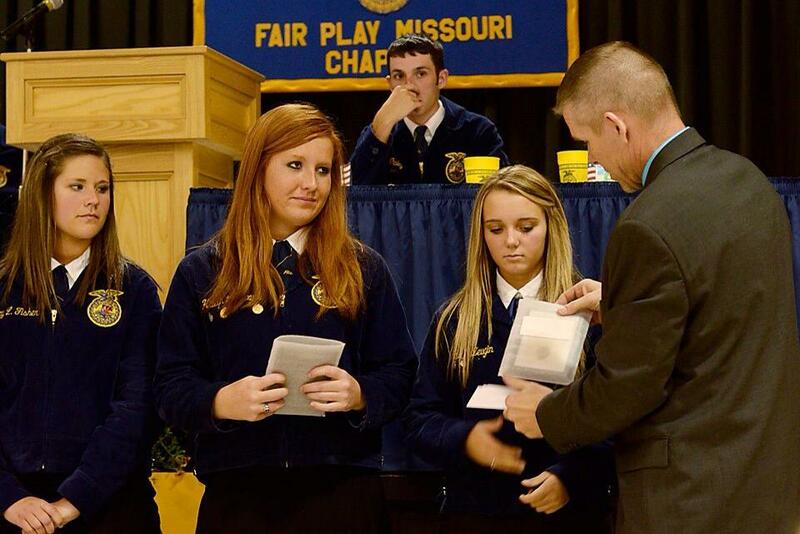 You think about the memories, the friendships and the accomplishments you have experienced during your FFA career. Even though you are sad it is over, you realize that those memories will stay with you forever, your friendships will continue and those accomplishments will benefit you the rest of your life. Plus, you know there is still opportunity for you to remain involved! 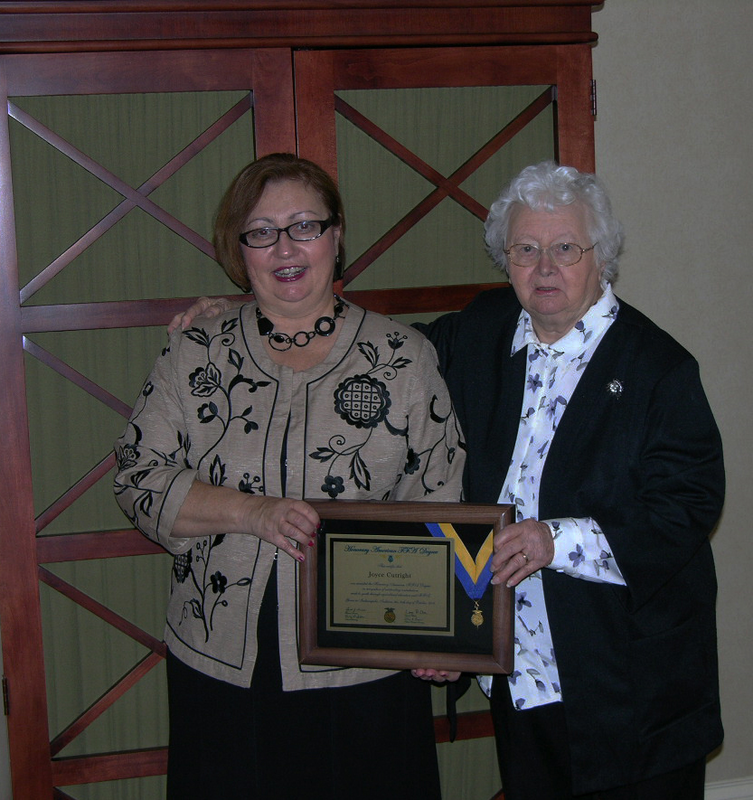 Honorary FFA Degree is awarded to Joyce Cutright. 25. FFA provided you with much more than you could have ever imagined. You have an understanding about the importance of agriculture, you have acquired skills – leadership, knowledge, teamwork and dedication – that will positively affect your future endeavors, and you are inspired to make a difference. FFA is a big deal and a true blessing, there is no doubt. 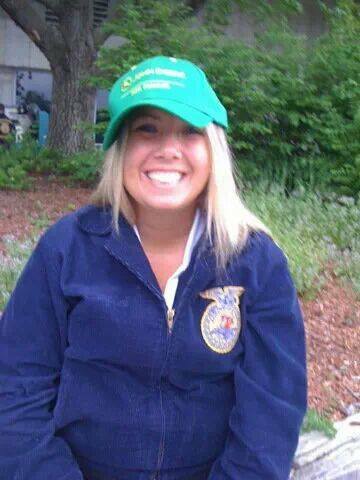 FFA makes me HAPPY, HAPPY, HAPPY! 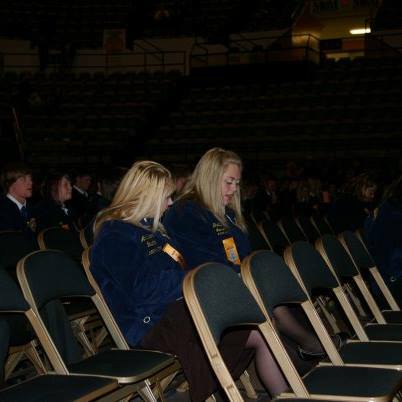 As you can see, FFA is a special organization that has impacted and influenced thousands. The opportunities within FFA are abundant. You can travel. You can gain life skills. You can learn. You can grow. What has FFA done for you? What are some of your fondest memories? 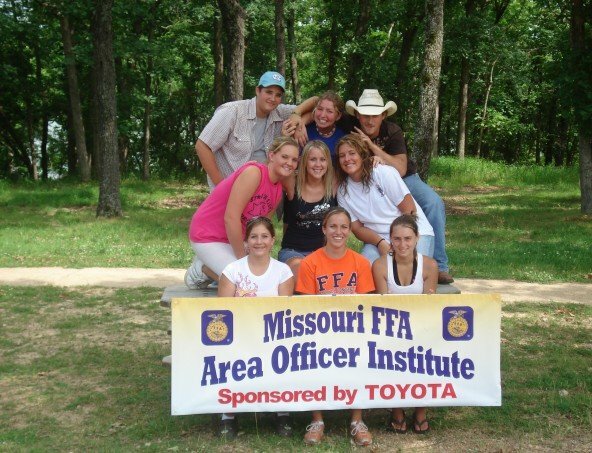 I hope this serves as a way for you to reflect on your personal experiences within the FFA. I also hope this makes you realize just how lucky we are to have an organization like this available for students across the nation to be involved in. In honor of FFA week, I just want to take a moment to thank the National FFA Organization. Thank you FFA for providing me with some of the best memories of my high school career. 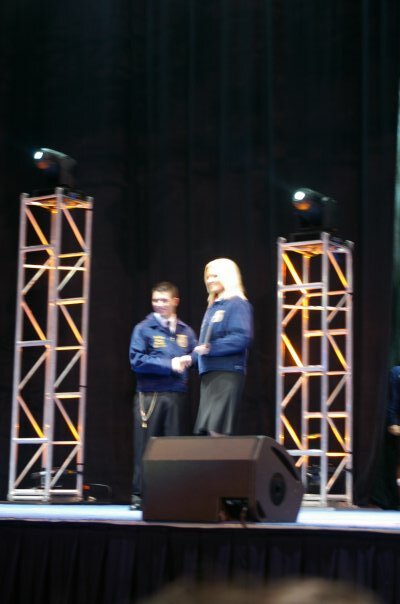 Thank you FFA for the opportunities. Thank you FFA for the good times. Thank you for the laughs. I am FFA proud. Are you? Share this if you are! 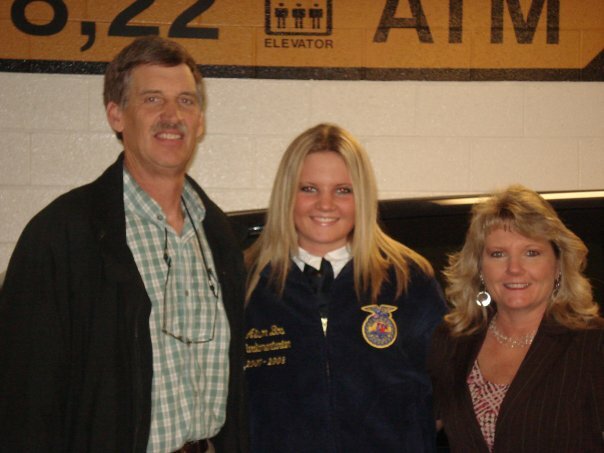 My parents were my inspiration to be so involved in FFA. 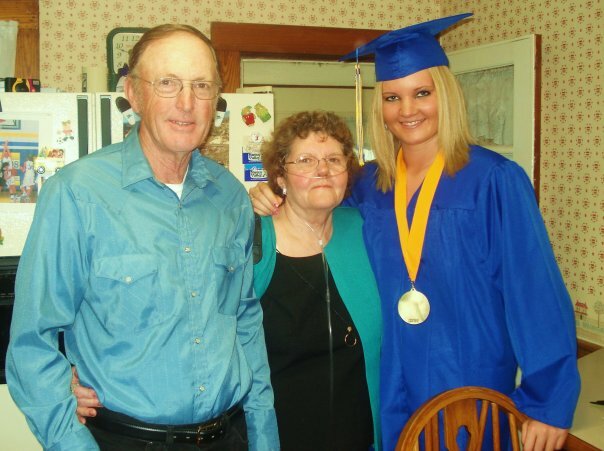 – I am a proud FFA alumnus from the Billings, Missouri FFA Chapter and the daughter of Alby and Angela Bos. My dad is the current FFA advisor at Billings High School and was an active FFA member during his high school career. My mom was also an active FFA member in high school and was even the first woman to win the National Dairy Entrepreneurship Proficiency Award. In addition, I have one cousin and several good friends who teach agriculture. So, FFA means more to me than many realize! 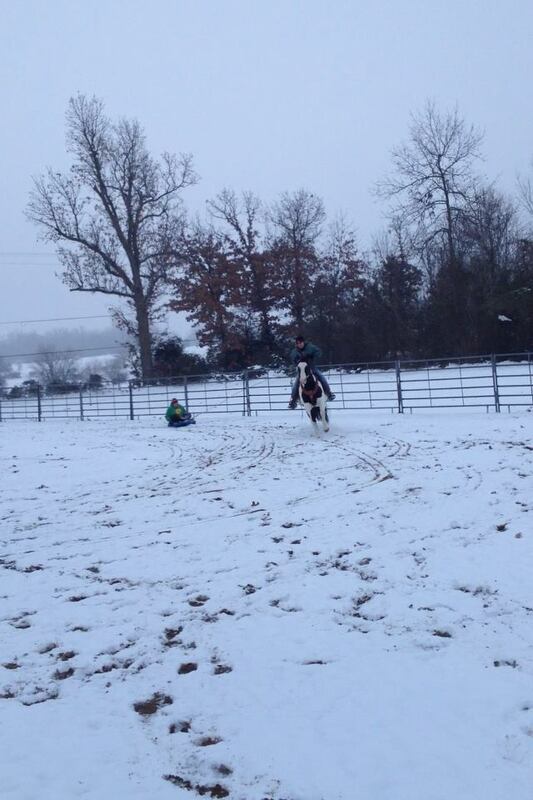 Photo Courtesy of- Shawna Estep, Marionville, Mo. This post is dedicated to a very special young lady who was taken from this Earth way too early. 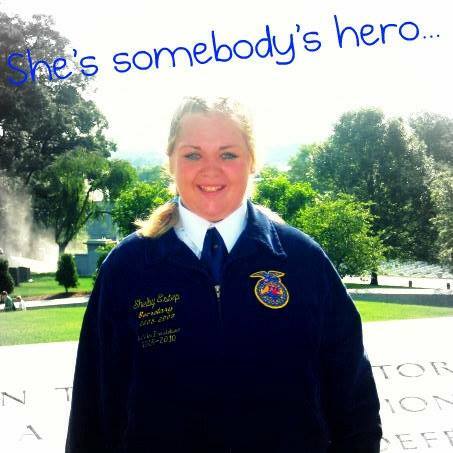 Shelby Lea Estep was someone who was truly passionate about FFA and wore that blue jacket with pride wherever she went. 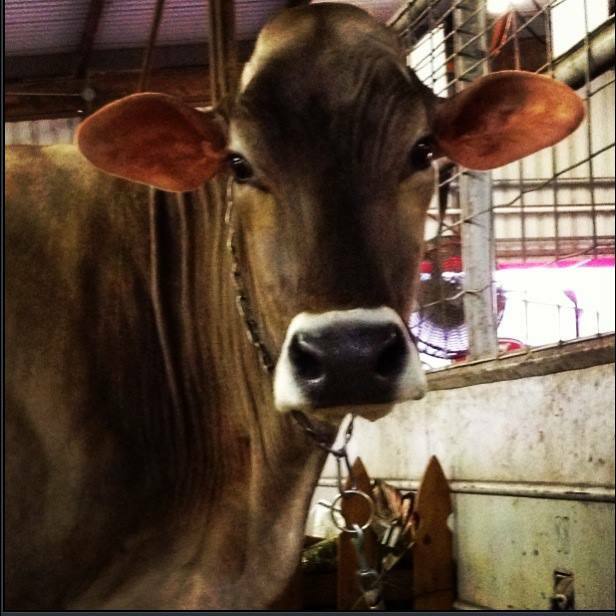 I was fortunate to go on a few trips with this girl, as well as see her at fairs in the area. 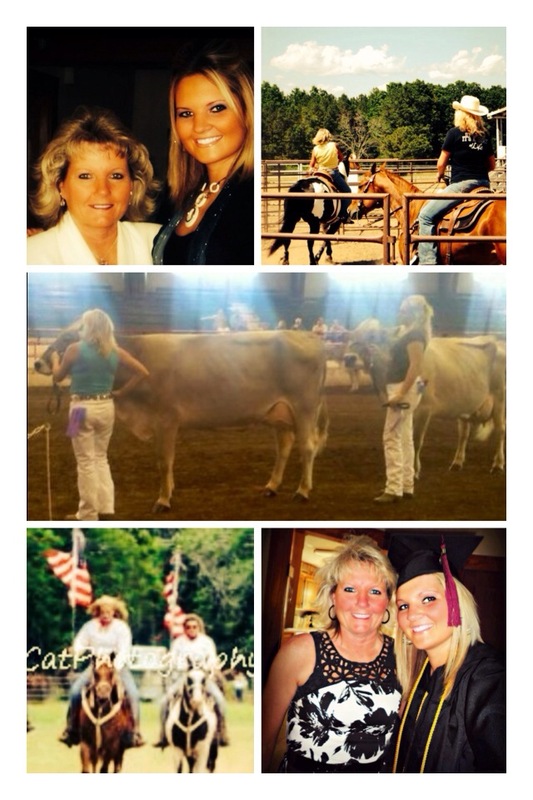 FFA meant so much to her, and I am truly honored to be able to write something to dedicate to her memory. Other Photos of FFA Members in Action! 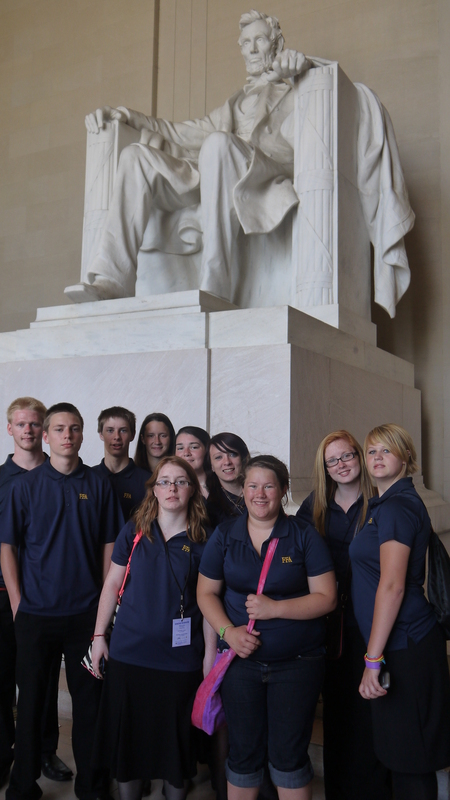 Washington Leadership Conference held in Washington D.C. 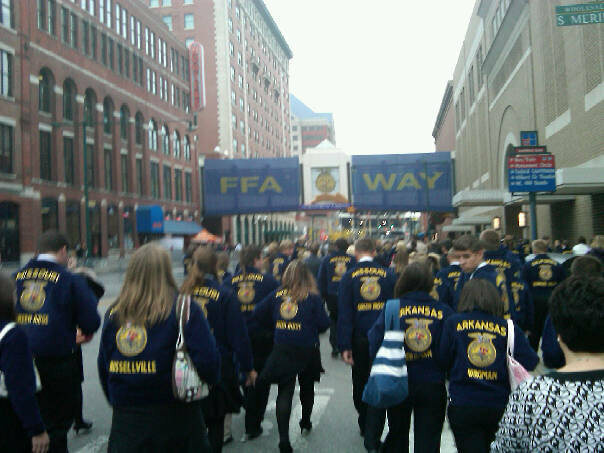 Being in FFA meant having the opportunity to travel to national convention. You usually get to go visit attractions while you are there. While in Louisville, my chapter visited Churchill Downs! 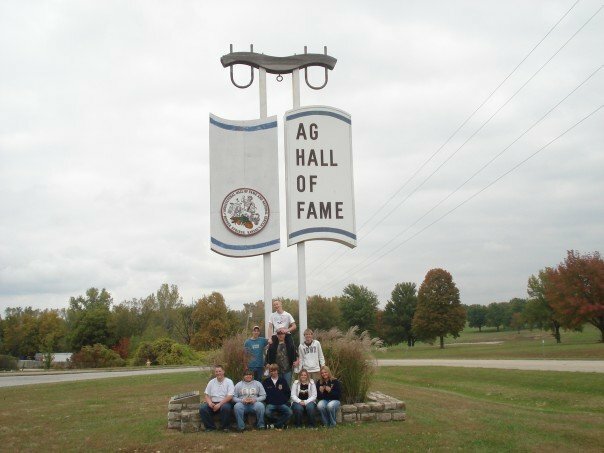 Trips to places like the National Ag Hall of Fame are example of field trips FFA chapters take. Let’s face it. There are thousands, maybe even millions, of people who have never actually been around farm animals. There’s people who have never touched one, and in several cases, have never even seen one in person. 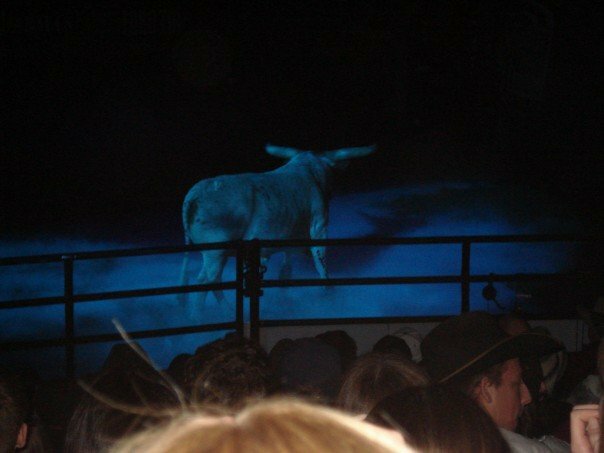 The only contact or knowledge of farm animals have come from a television screen or a computer. It is hard to believe, right? It took me a while to understand this concept, but after witnessing this personally, it comes as no surprise. 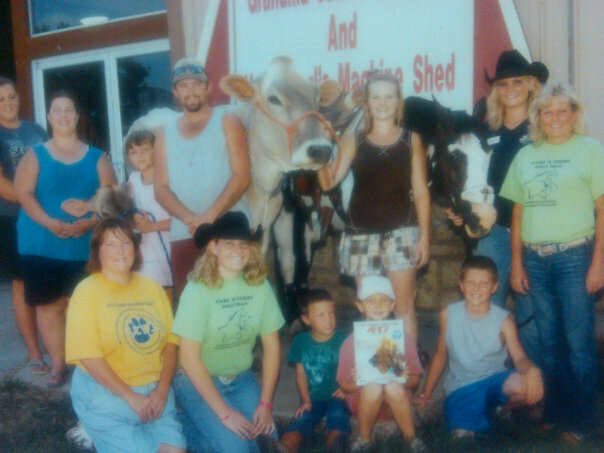 You see, a few summers ago during an internship, I had opportunities to participate in public dairy education activities. 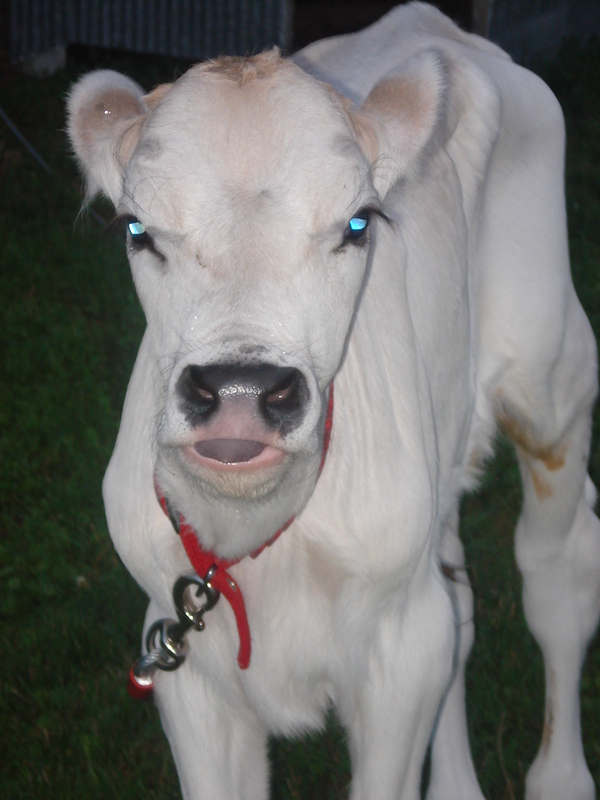 The first one, I had actually brought one of my cows with me to allow people to pet her, touch her, take pictures, etc. 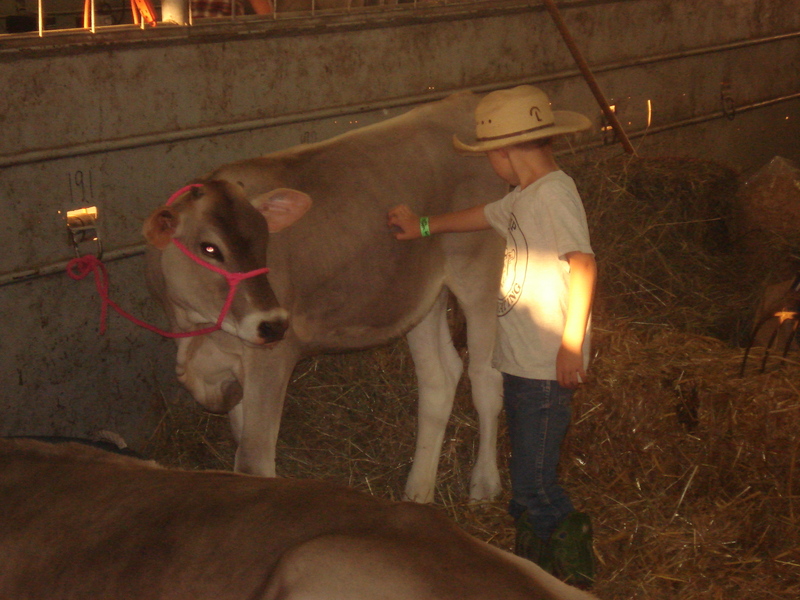 There was an older woman (probably in her late sixties), who told me, “Hun, this is the first time I have ever seen or touched a cow.” I could not believe it! 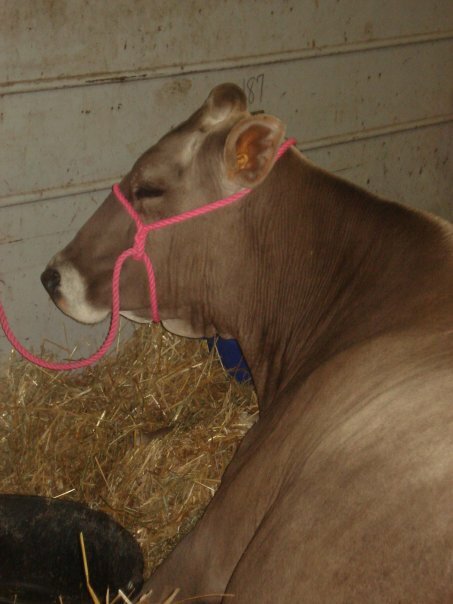 I had similar experiences while at the Missouri State Fair. People of all ages would tell make comments such as “I had no idea that is where milk comes from,” or “Look, mom it’s a real cow!” As I would pick my jaw up off the ground, the reality would hit me. There are so many people who just do not know. There is no question as to why people have false perceptions of what modern-day farming is all about. It is a lack of education – which we have to change – and getting the false idea of what farming is from movies and internet videos. Movies like Babe, Charlotte’s Web, Home on the Range, The Barnyard, etc. 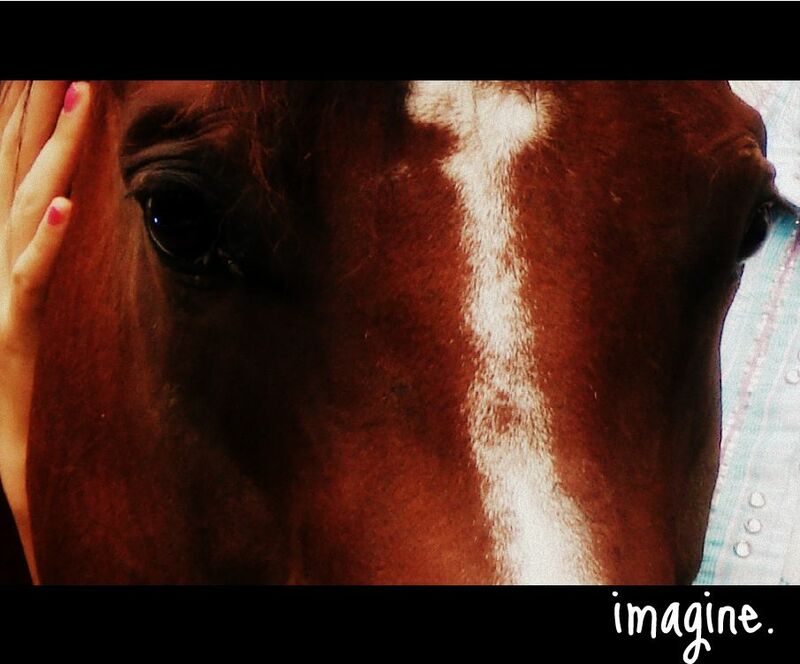 give viewers the idea that farms should have a big red barn, white fence, rolling green pastures and animals roaming around as they please. Yes, there are a few farms like this; however as agriculturists, we know that we could not provide enough food if all farms were like that. It is reality. It is fact. There is no other way around it. Then you have what people can find on the internet. There is so much material containing false information or portraying false images of agriculture. Videos of animal abuse, commercials and mini TV series are a few of what goes viral and is seen by millions. Obviously, not all farmers are abusers. Large farms are not what the “Scarecrow” commercial shows. Last, but certainly not least cows will not explode like the new Hulu TV series called Farmed and Dangerous implies. You see, there is so much false representation out there. It is up to people like you and me to tell agriculture’s story and educate the public about farming methods/practices. I know that this is a topic of several blog posts out there and this is information that most of my readers are aware of. I am a person who enjoys humor and loves to laugh. With this being said, I decided to put my own twist on this post and provide you all with something you can smile about. 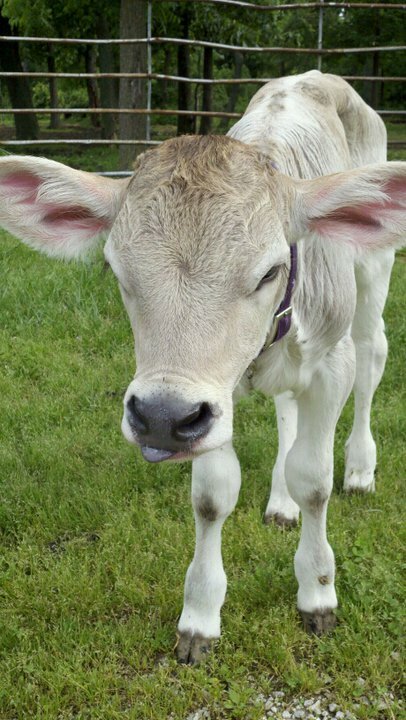 If you are a reader out there who does not know a lot about farm animals, maybe this will give you something to smile about, as well as something you can learn from. I came up with a list of ten common misconceptions of farm animals that people have. 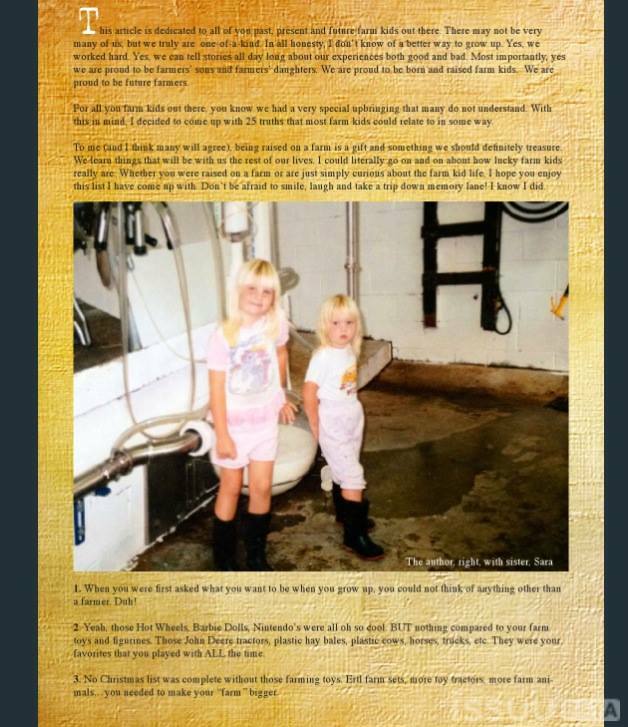 Some of these are things you may have heard before, but I decided it was time to write something credible about farm animals. 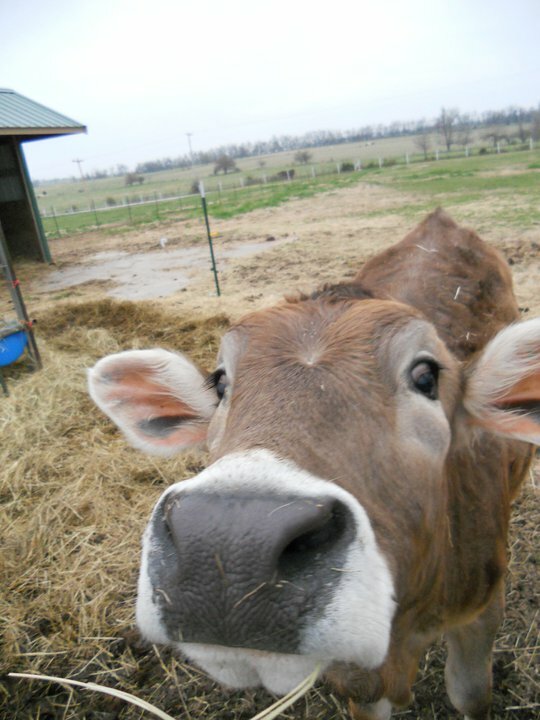 So sit back, feel free to smile and enjoy this list of ten misconceptions of farm animals! 1. 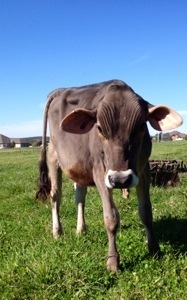 Brown cows do not produce chocolate milk. Sorry to burst your bubble, but they do not. Chocolate syrup (or something similar) is what makes chocolate milk. That is fact. 2. Pigs do not talk to spiders, do not herd sheep and do not magically keep themselves clean. I know Babe and Charlotte’s Web tells something completely different, but that is Hollywood folks. If you have been around pigs at all, you know that is okay for them to be dirty. Sometimes they like to lay in the mud in order to cool off. So if you see a pig that is very dirty, do not panic. That is how they adapt to their surroundings and regulate body temperature. 3. 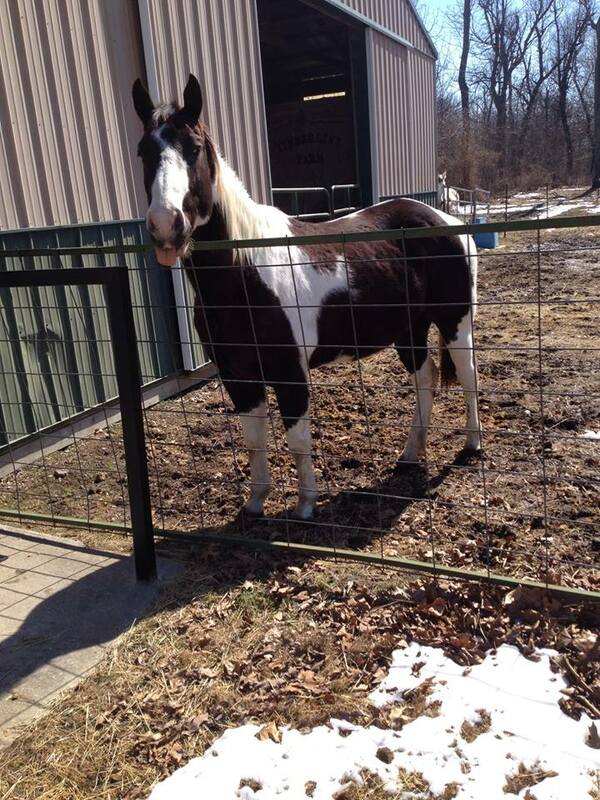 Let’s talk about horses for a minute. 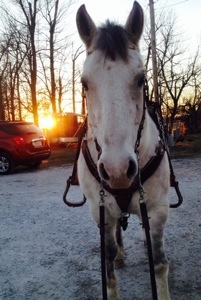 As cool as Silver looks while rearing as The Lone Ranger says “Hi, Ho Silver!” that is not a desired response while one is riding a horse. 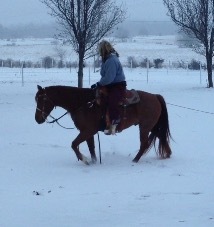 While we are on the subject, horses are not ridden like you see in some western movies. 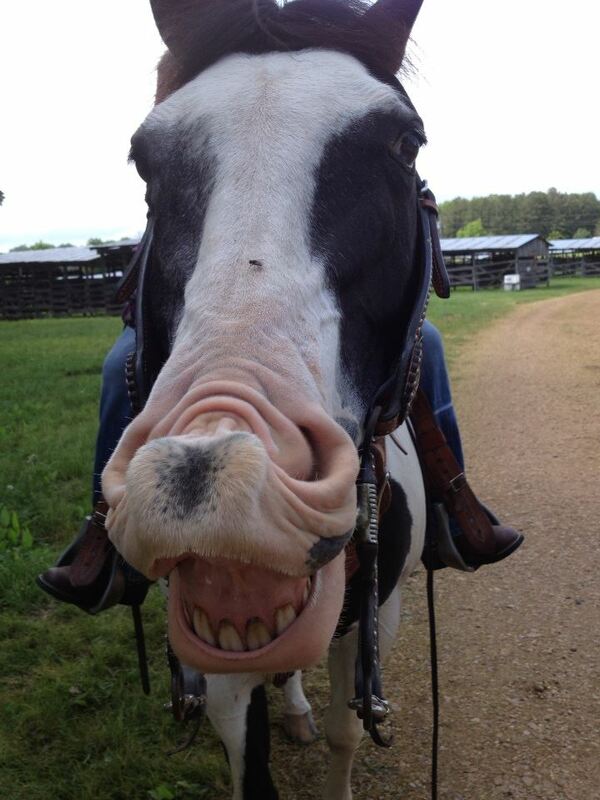 The picture below shows how horses are generally ridden. No arms going everywhere, no guns, no being chased by Indians, etc. Sorry! 4. Most farms are not barnyards full of a few cows, a couple horses, a small flock of chickens, a goat, some pigs and a sheep or two that live together in a red barn surrounded by white fences. It is just not the case. Today, farms have to be bigger and more specialized to be able to meet the food demands of our rapidly growing population. Trust me, this is true! 5. Bulls do not just attack men in leotards carrying a red cape or when they see red in general. Yes, this is the case in Looney Tunes; however it is not the case in real life. Truth is, bulls are very dangerous animals that can attack a person at any time. 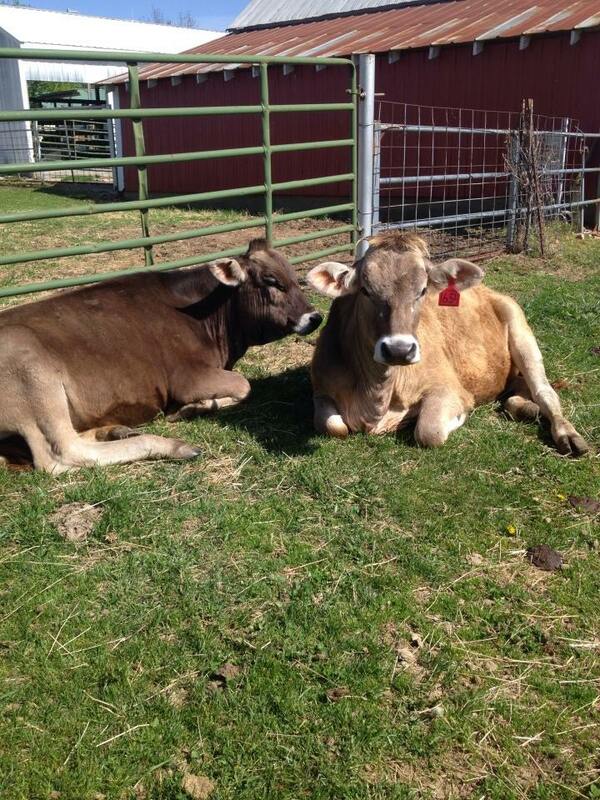 (They are very important obviously because without them, no calves would be born. By the way, even though the movie Barnyard shows differently, bulls do not have udders!) This is why artificial insemination is a safer option. This also shows just how much danger some farmers put themselves in on a daily basis. Bottom line, bulls are not to be trusted. 7. 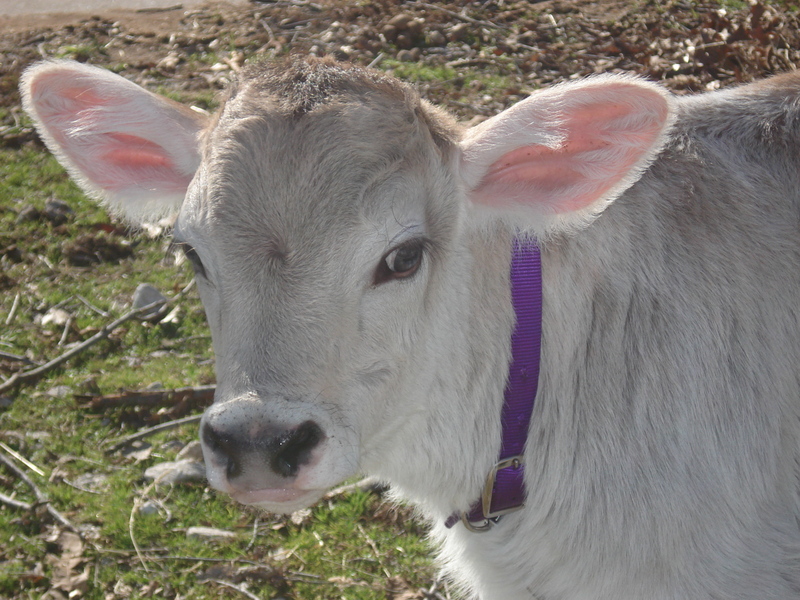 Most dairy cows do not wear bells. (Yes, I know there are some in some countries that do; however that is not a common occurrence in North America.) Dairy cows do not sing, do not actually advertise to “Eat More Chik-N” and do not literally help raise your kids. And in case you wondering, California is not the only state where “happy” cows come from. 8. Gathering eggs is not always a pleasant experience. There are some hens that will flog you causing you to run around the coop like a crazy person. Plus, you always have to watch out for the rooster. Those dudes are plain unpredictable. Oh, and geese? They are not your typical “Mother Goose” figure. They are completely opposite actually. Just ask someone (cough, cough this girl) about how it feels to be chased by one. NOT FUN! 9. Farm dogs are more than the old dog that just lies on the porch all day or than a dog that just chills in the bed of a pickup truck all the time. (Most cases they are not old bloodhounds like you see in a lot of shows and movies.) 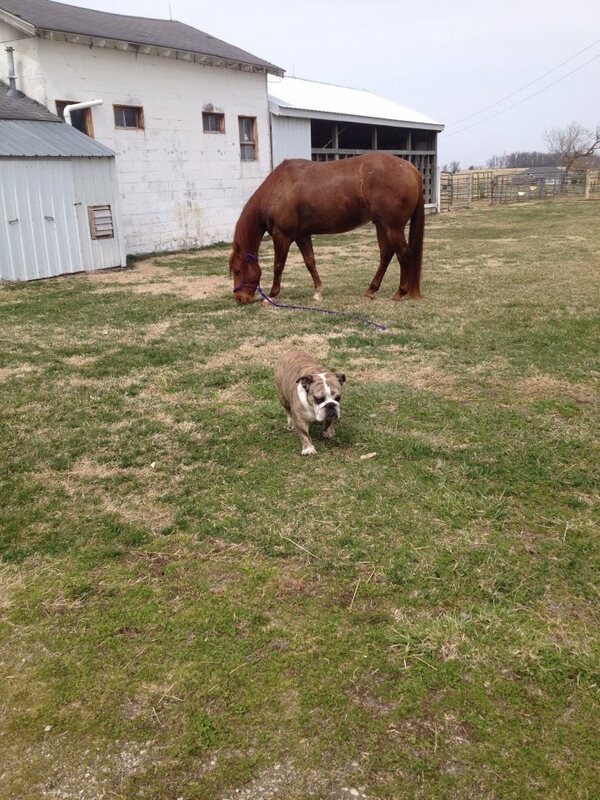 These dogs are a vital part of many farms. They can work livestock, protect livestock and are usually very good watch dogs. 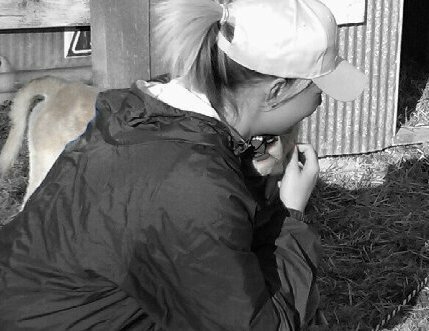 Instead of “man’s best friend,” they are simply a farmers best friend. The cool thing about this? These dogs love what they do! 10. Farm animals require constant care and attention. Movies tend to not show the hard work, time and effort it takes to care for these animals. Reality check—you ready for this? Farm animals are challenging and expensive to raise and care for. They do not feed themselves, they do not build their own shelters, they do not magically heal themselves from injury/disease, they do not just suddenly walk out the gate to go on an adventure to save the farm, they do not “party” during the night when the farmer is asleep, etc. Truth is, they are animals. They are animals who supply us with food, fiber and so many other products. What makes a farm animal able to do this? Farmers who are good managers and caretakers. This list could easily go on and on. These are just some things that I have heard personally or just find funny. Now can you see how easily it is for people to have false impressions of farming and agriculture? There is so much influencing factors out there that cause people to have an idea of farming that is simply not true. It is time for a reality check. Farming is not what you see in the movies. It is not what you see in those cruel videos. Farming is what puts food on our tables, clothes on our backs and so much more. Farm animals play a major role in this. Think of what you eat on a daily basis. Pizza, hamburger, egg, ice cream, steak, wool, milk, etc. are all examples of what farm animals provide. Think of life today if we did not have farm animals? Not a pretty picture is it. See the image below. 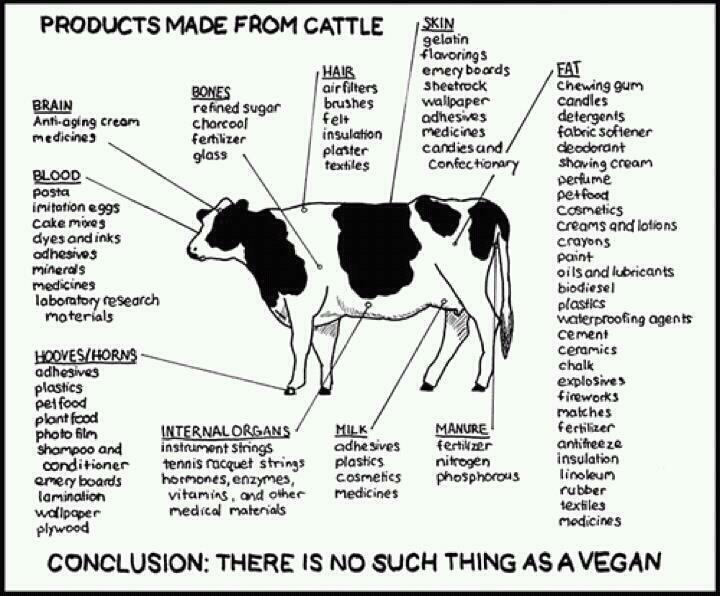 All of these products come from cattle. They provide us with a lot don’t they? I hope you got a smile or two out of this. I know I did! Ultimately, I do hope this serves as an eye-opener of what farm animals are and what they are not, as well as what they do or what they do not do. They are extremely important to our food supply, which is something we have to realize. 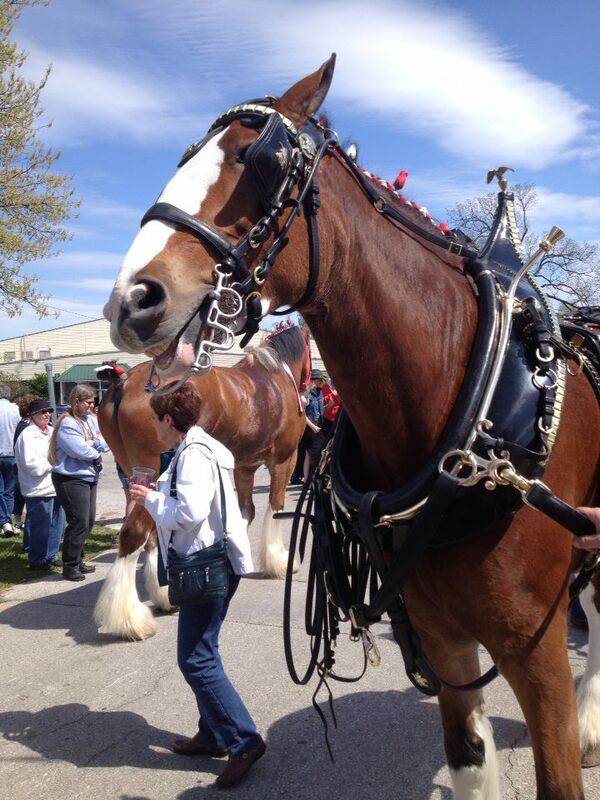 In addition, we must remember to thank those who dedicate their lives to raising and caring for these animals. I will close by saying this. In honor of Thank a Farmer week, which was last week, I want to extend a special thank you to all of our farmers and ranchers. Your hard work, difficult lifestyle, commitment and dedication is extremely appreciated. Keep up the good work as you continue feeding the world. Remember, to be sure to thank a farmer and appreciate farm animals. We all stand for something whether we are aware of it or not. We stand for something we are passionate about, something that is important to us. We take a stand and encourage others to stand with us. I stand for agriculture. Why? It is my passion. It is something that I understand we could not live without. It defines my family and upbringing. Most importantly, agriculture defines our future and it is time people understand that. Let’s get this trending on Facebook and Twitter using this: #istandforAG. Let’s make some noise!!!!! I took a different approach to writing this. I provided reasons to stand for ag from a farmer, agvocate and consumer standpoint. The farmer and agvocate standpoint was easy; however writing from the consumers standpoint was a bit of a challenge. So what I did, I wrote from the standpoint of a consumer who has learned about agriculture and its importance. I provided something we can all strive towards. One day, if consumers would have these responses, I sure would be happy, happy, happy. So, let’s get to it. 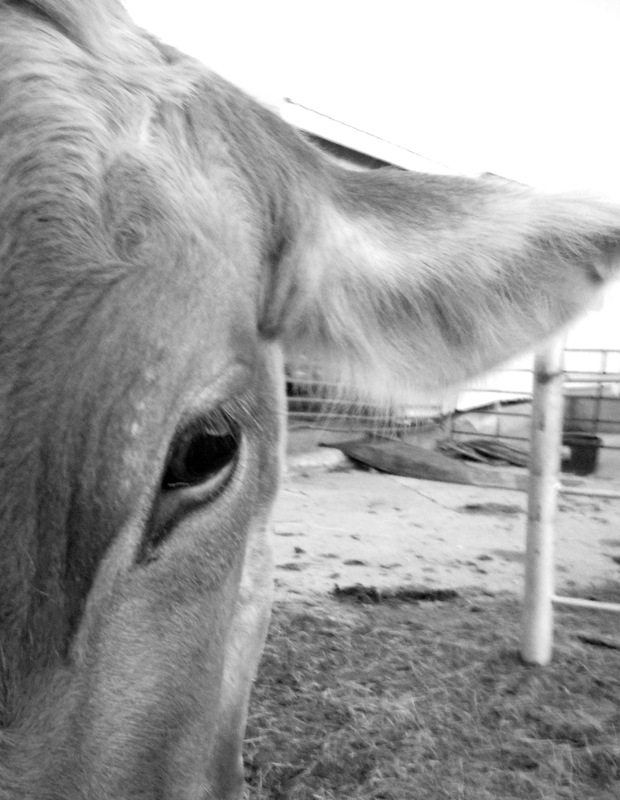 Let’s find out why #istandforAG. I stand for Ag every time I wake up at the crack of dawn knowing I have a full day’s of hard work ahead. Caring for livestock, fixing fence, repairing the tractor, keeping track of farm records…you name it. I may complain, but deep down I would not trade my life for anything. Then at the end of the day, I lay my head on my pillow and thank God for seeing me through another day. I stand for Ag every time I spend countless hours in the tractor seat – whether it be baling hay, planting, feeding round bales, etc. Some may see this as boring, but to me, I see this as a way of life. 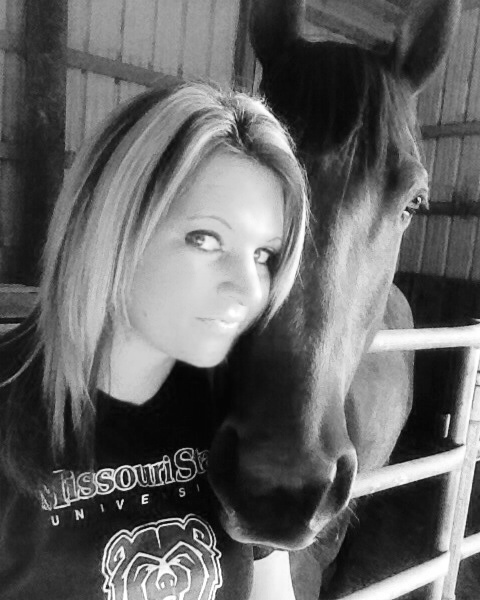 I stand for Ag every time I spend countless dollars and time working hard to save the life of one of my livestock. Whether it be delivering a backwards calf, saving a horse that has coliced or giving my vet a call in the middle of the night to come help with a sick animal, I do everything I can to make sure my animals are healthy. 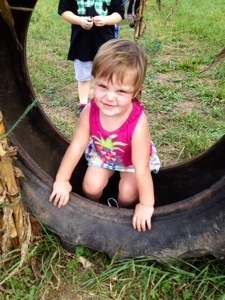 I stand for Ag every time I see farm kids – either my own or someone else’s – helping out and/or playing on a farm. I know that is the future of our food supply, and I will do all that I can to show them what hard work, commitment and a true love of the farm life is like. I stand for Ag every time I see my family. When I see my parents, my siblings, my grandparents, my aunts/uncles, my cousins, etc., I have a sense of pride that I am continuing the family tradition. I realize that I am blessed to be part of a farming family! I stand for Ag every time there is a year of hardship and heartache. Natural disasters, disease, increased input prices (feed, fuel, labor, etc. ), decreased commodity prices…I remain optimistic that next year will be better. I love the lifestyle too much and have learned that it is not for quitters. Farming requires faith and grit, which are two things that I rely on. I stand for Ag 365 days a year, 7 days a week, 24 hours a day. I endure harsh working conditions. I face hardships. I work long hours. I have the responsibility to provide for my family, my land and my livestock. I am responsible for feeding the world. I am a farmer, and I am important. I stand for Ag because I understand just how important the industry is. I know that without it, we would not survive. I stand for Ag because I know that it is what will feed our growing population. It is our future, and I know I must work hard to help people understand that. I stand for Ag because I know we rely on a small portion of our population to feed us. (In the United States, less than two percent of the population is involved in production agriculture.) I know that I must work to keep those who feed us able to do their jobs without scrutiny. 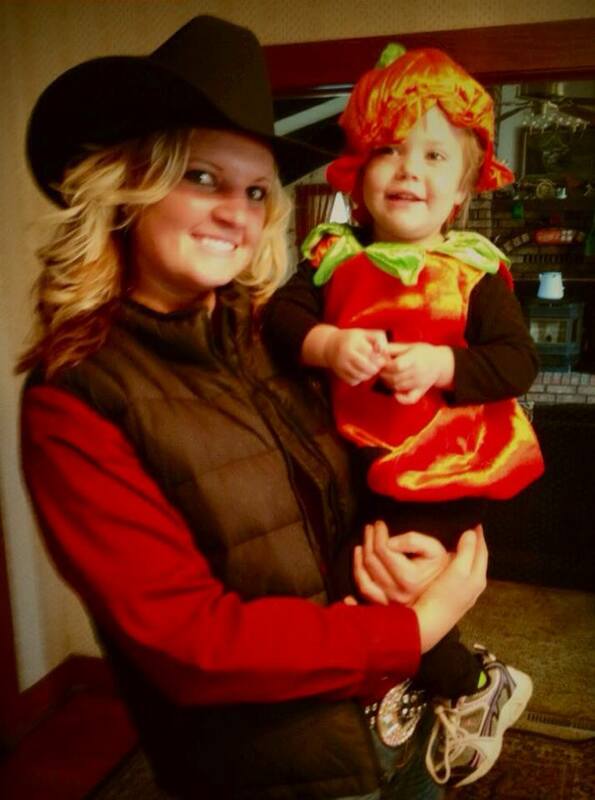 I stand for Ag because I am concerned about my future, my kids’ future and everyone’s future. 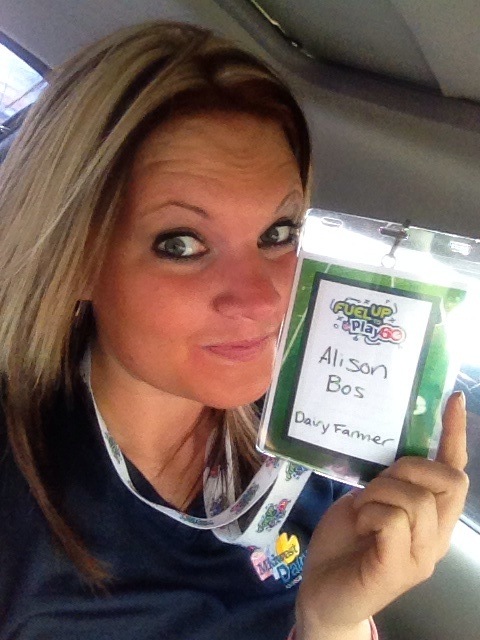 I am investing in education to learn more so I can be a better “agvocate” for the industry. I stand for Ag because I cannot tolerate farmers and ranchers being victim of attacks from animal rights and environmental groups or not gaining support from our government. I cannot stand to see farmers being portrayed as something they are not and getting treated without the respect the deserve. I am not afraid to take a stand. I stand for Ag because I am completely intrigued by the industry. I am amazed at the advancements that have been made to produce more food with less. 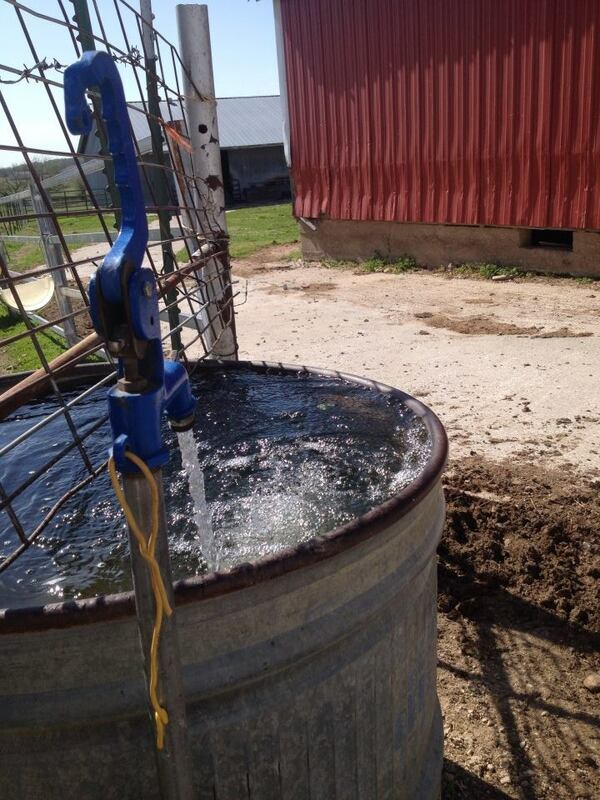 I am amazed at the pratices our farmers are taking to preserve land and conserve water. I am inspired by farmers’ resiliency and hard work ethic. I am also shocked that so many people are uneducated about the importance of the industry; therefore making me want to tell agriculture’s story to anyone willing to listen. 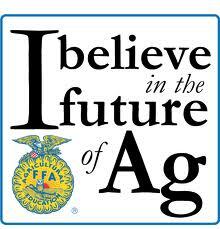 I stand for Ag because it is my passion. It is what my life is based around and how I want to spend my future. It is so underappreciated, and it is my goal to educate the general public about its importance. I want to be a voice for our farmers/ranchers. I stand for Ag every time I put food in my mouth. A farmer and/or farmers worked hard to produce that food, and I am thankful for that. Knowing I can put food on the table that is safe for me and my family to eat is humbling. I stand for Ag every time I walk into a grocery store and I know there will be an abundance of food available for purchase. Food that is wholesome, safe and affordable is a priority, and would not be possible without the efforts of farmers and ranchers. I stand for Ag every time I look at personal spending accounts and see that I do not spend a majority of income on food. Knowing I can afford food is a relief as I understand without food, I would not survive. 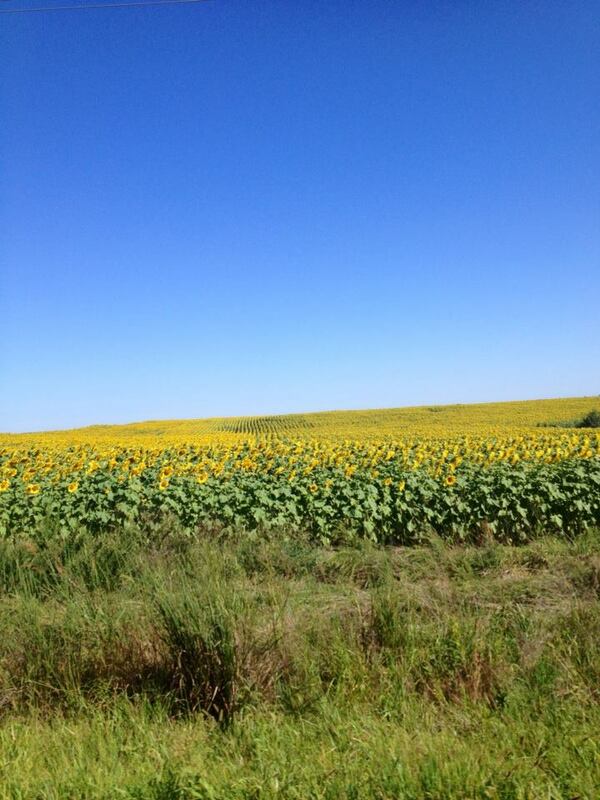 I stand for Ag every time I drive through the countryside and appreciate farms. I know the hard work it takes to operate a farm, and have full appreciation for those who dedicate their lives to it. I stand for Ag every time I get behind a tractor or combine on the road and do not get upset about it. I know that it is a very important part to almost every farming operation and is aides in providing me with food. I respect the individual in the driver seat and give them a wave as I pass by. 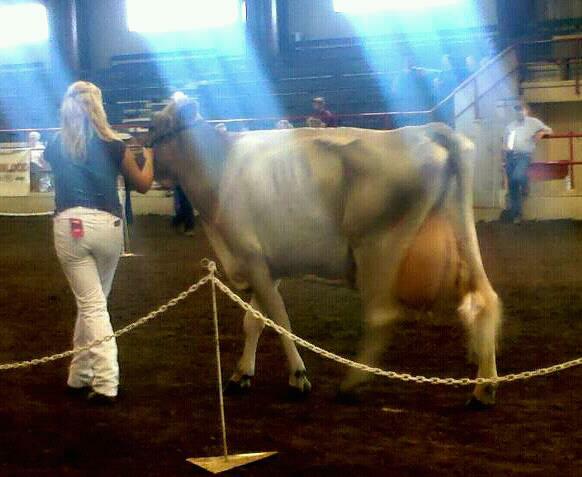 I stand for Ag every time I go to a fair and walk through the agriculture buildings. I see how much farmers care for their animals, as well as how much value they put into their products. I see they work hard and that they truly have pride for what they do. I stand for Ag much more than I realize. It is something that we cannot live without. I am thankful for farmers/ranchers and hope they know their value. 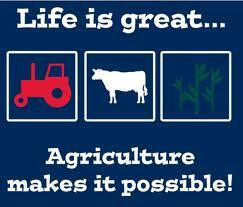 Agriculture allows me to have the life I do, and I am truly grateful. Agriculture is pretty important, right? We may have different reasons for standing for agriculture; however we cannot deny that 1) without agriculture, we would not survive; 2) farmers deserve so much more credit than what they receive; and 3) we need to educate as much as possible about agriculture’s importance.